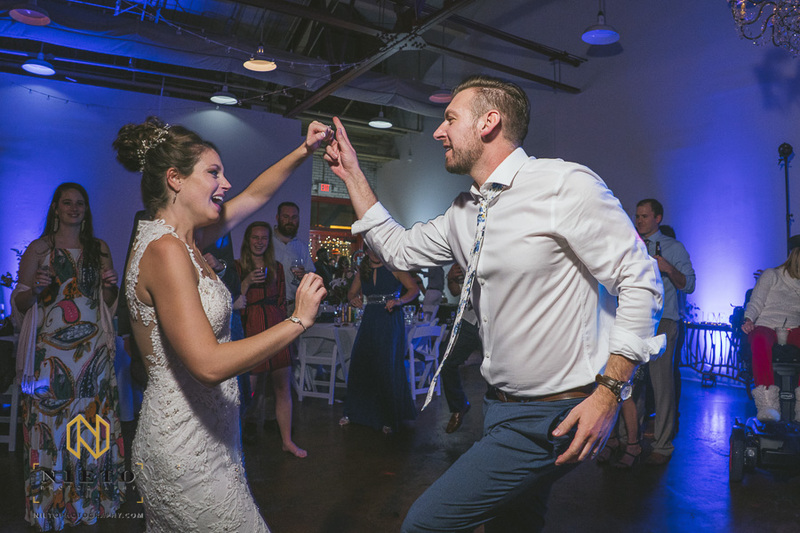 After a long day of wedding day stresses, everyone just wants to sit back, relax, eat dinner, and then dance! 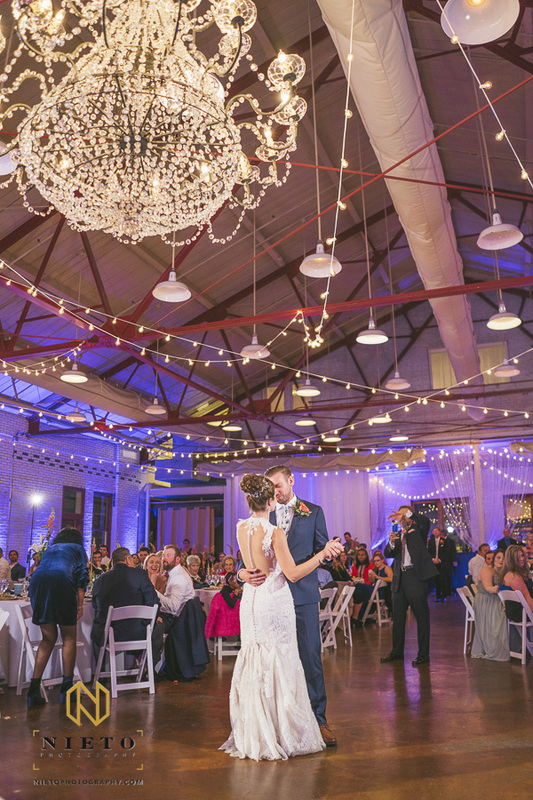 I don’t think that there has ever been a better Market Hall wedding reception. 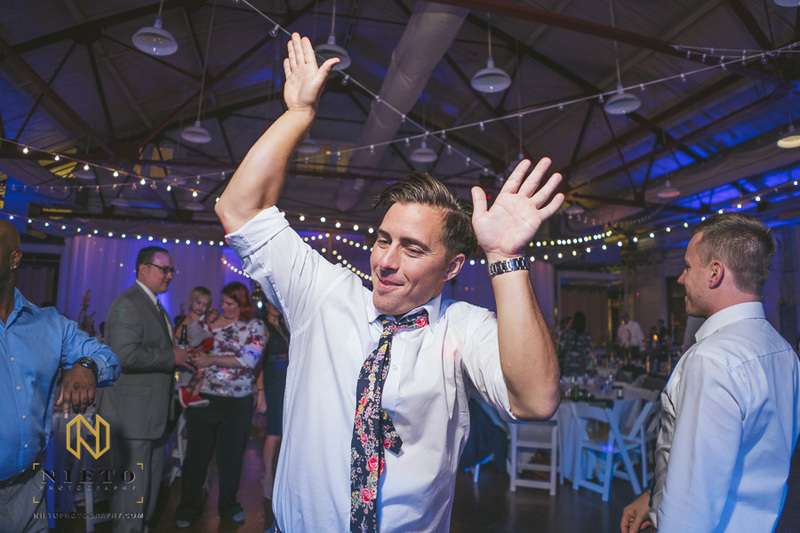 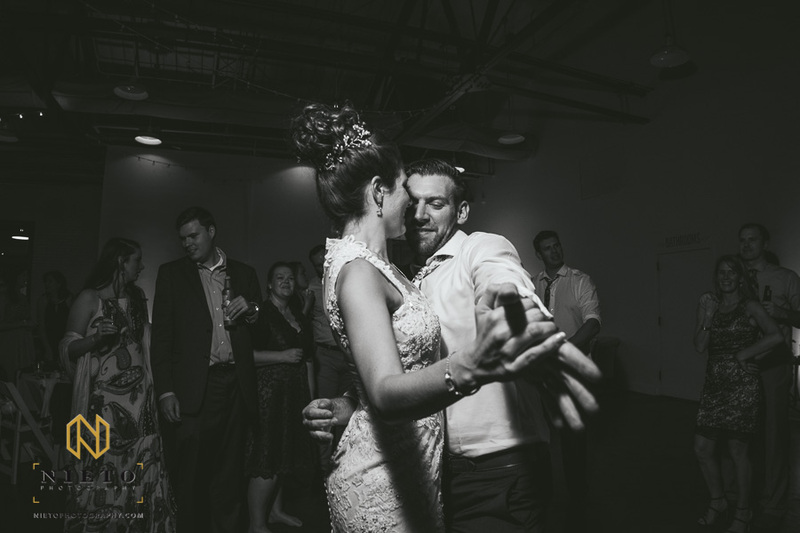 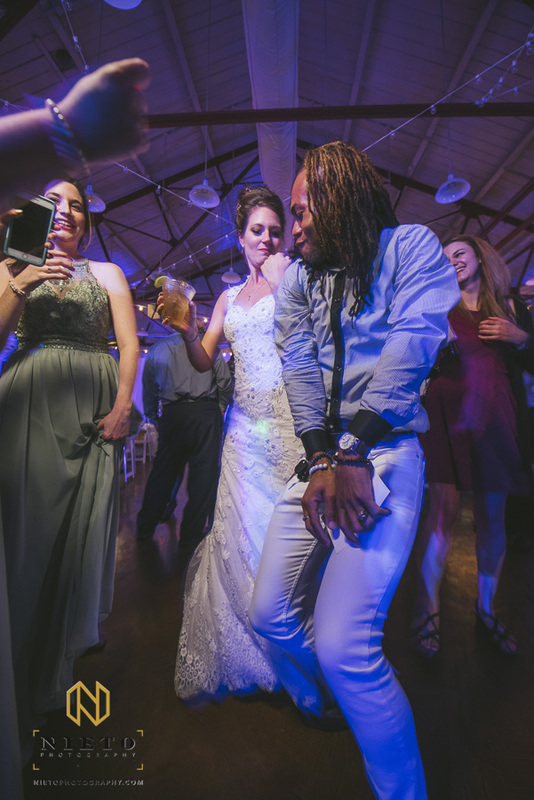 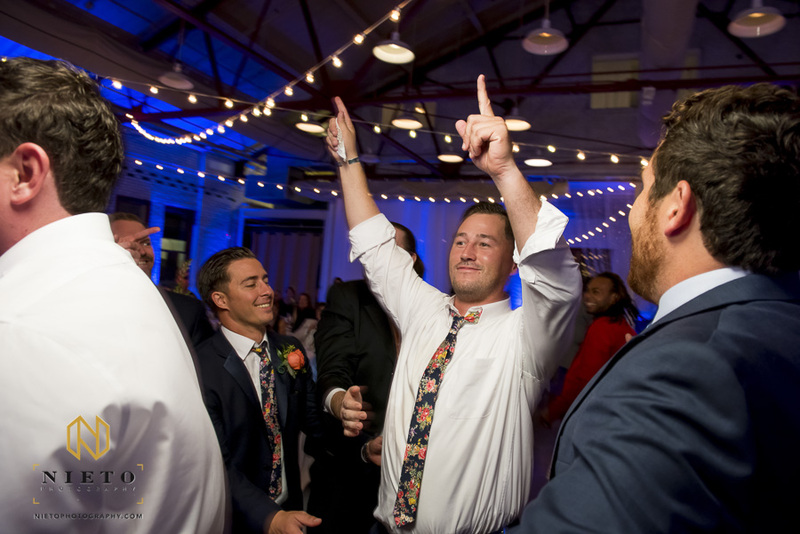 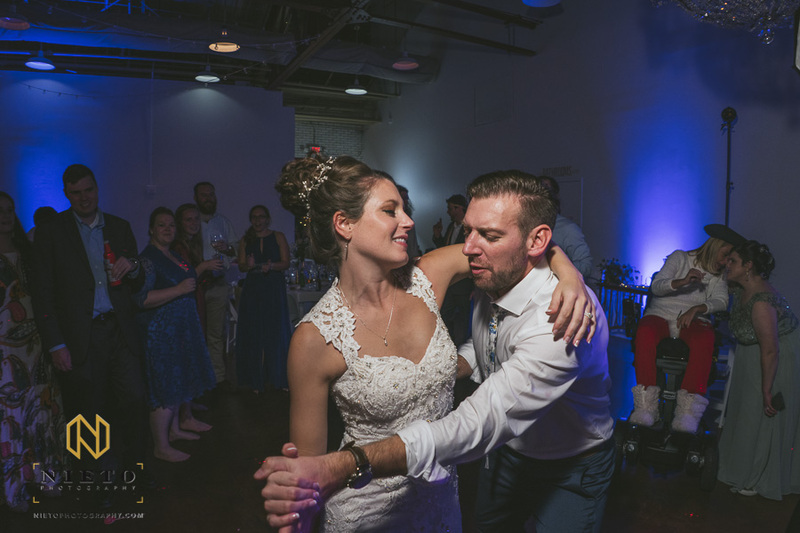 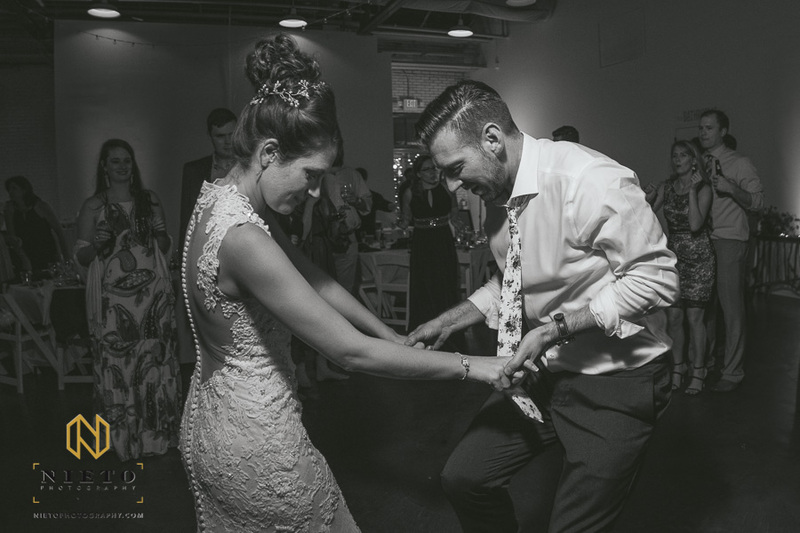 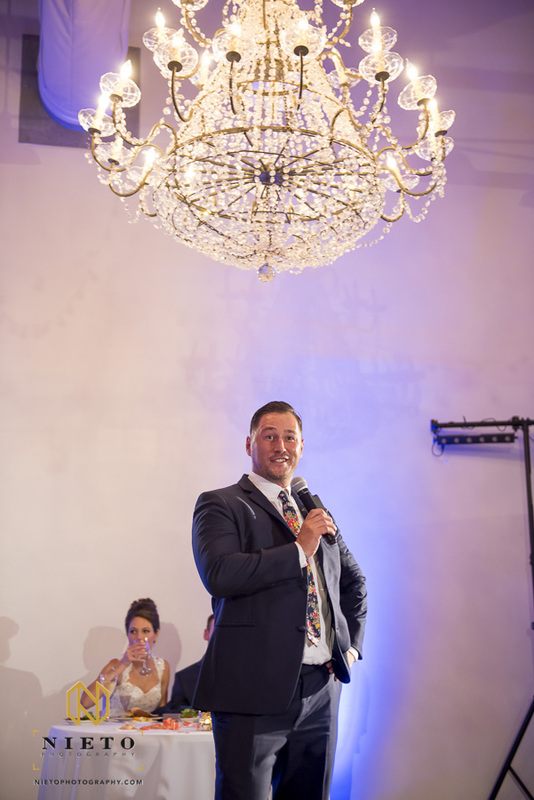 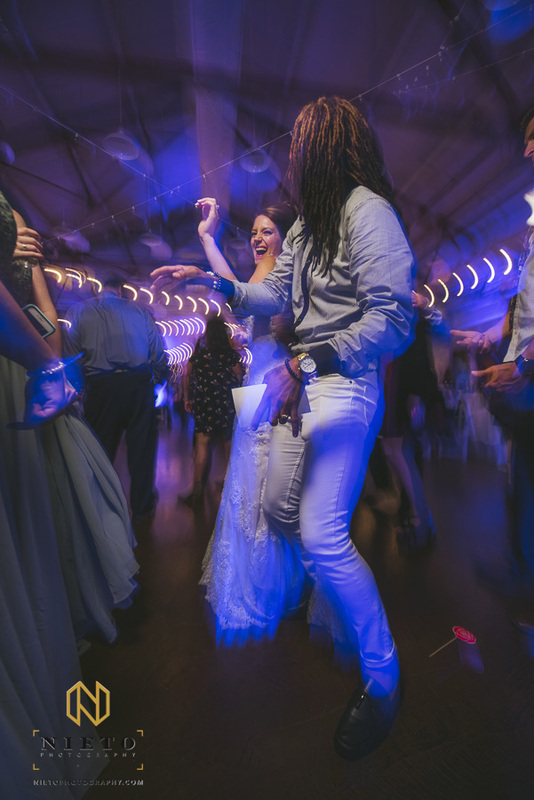 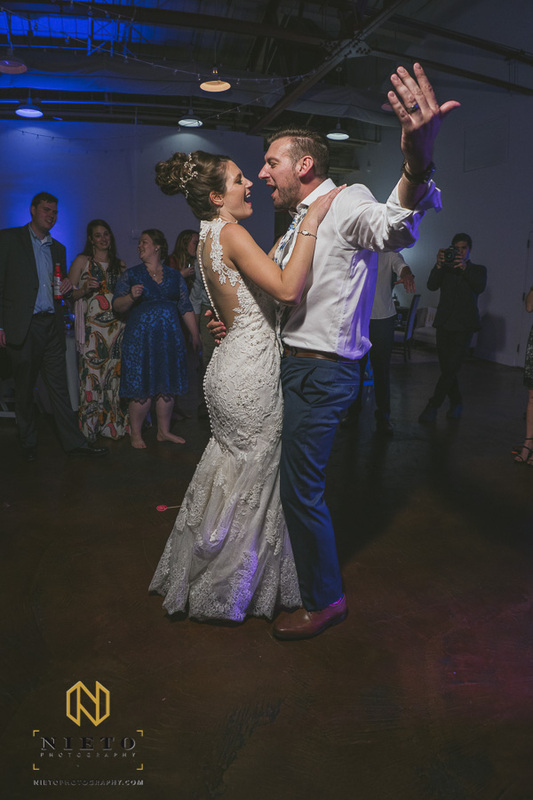 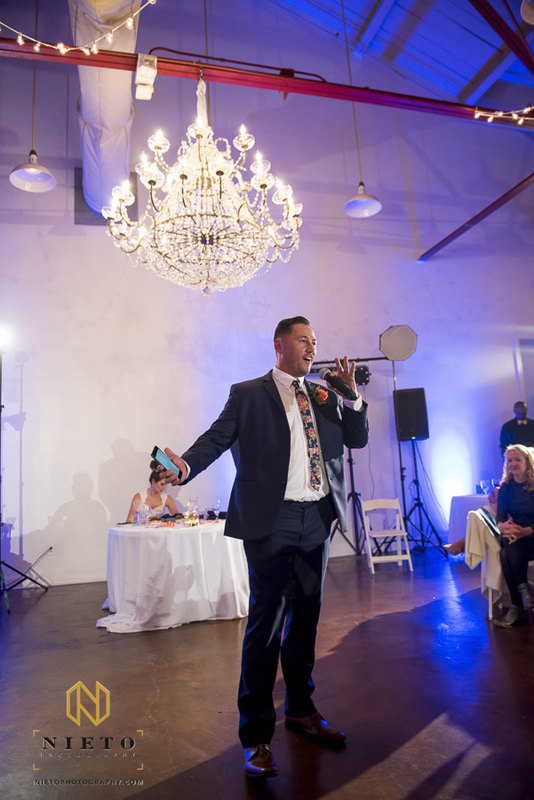 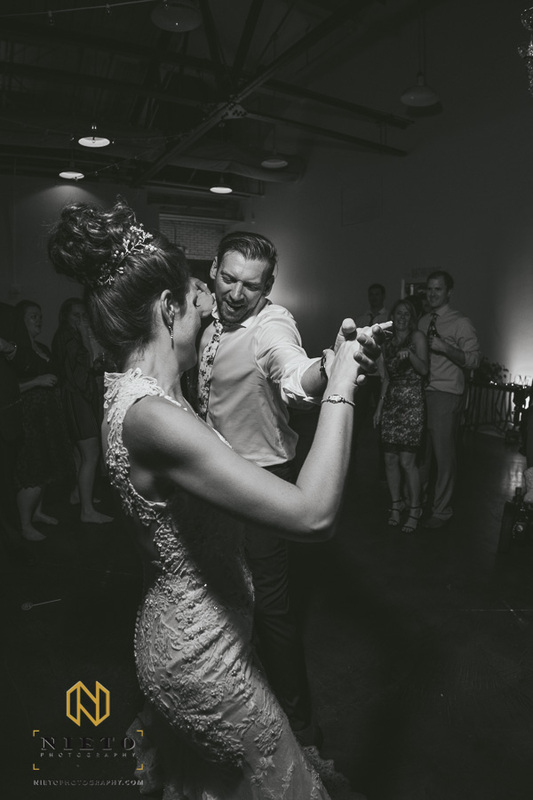 Once dinner and the toast were done, DJ NYCE moved the wedding reception to the DANCING! 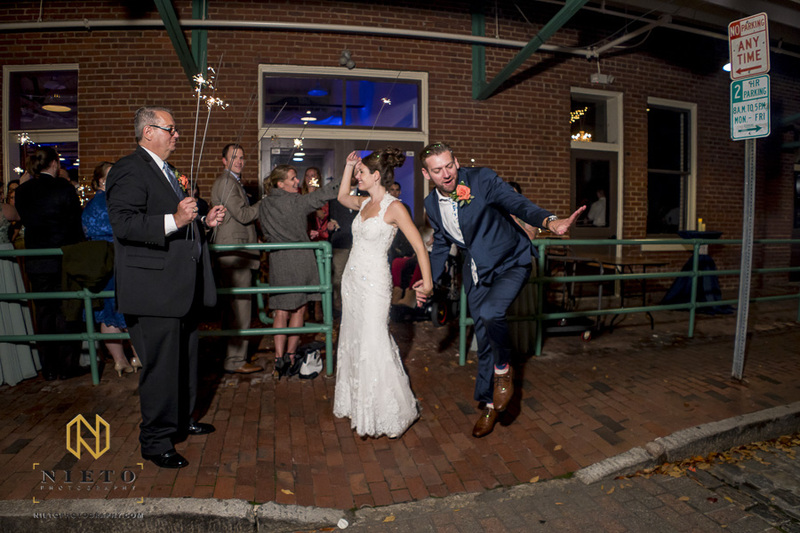 Their wedding reception was not for shy people. 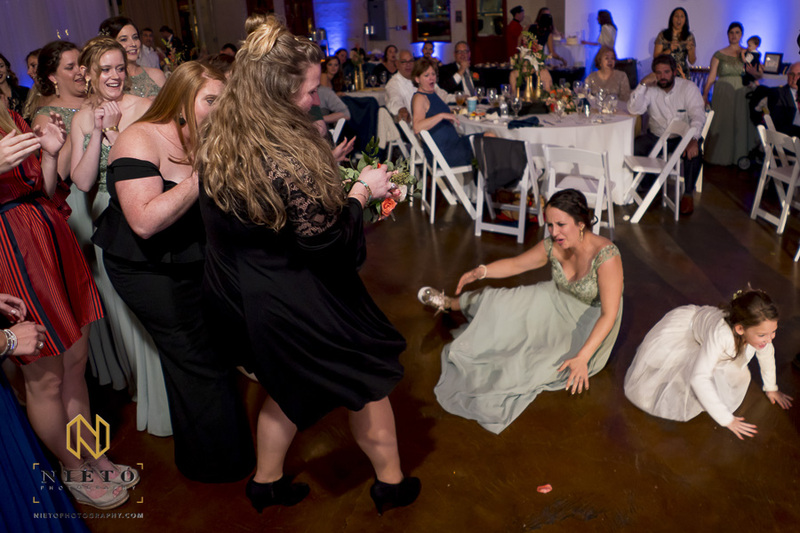 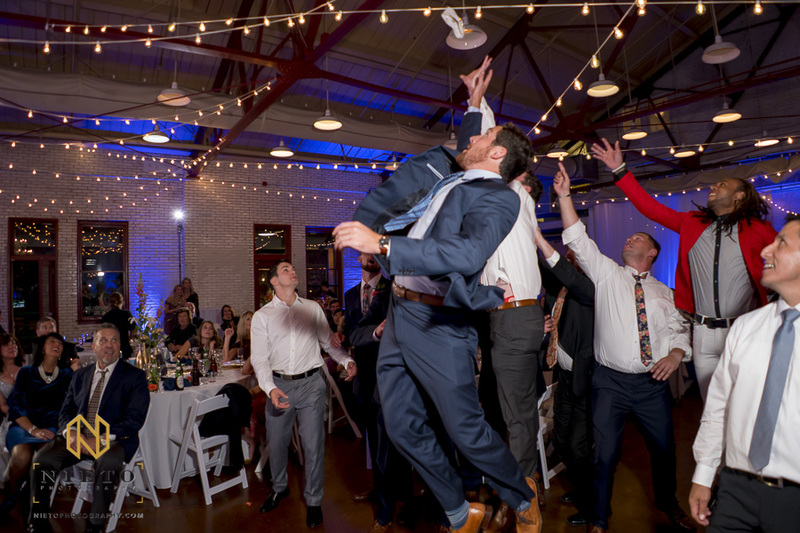 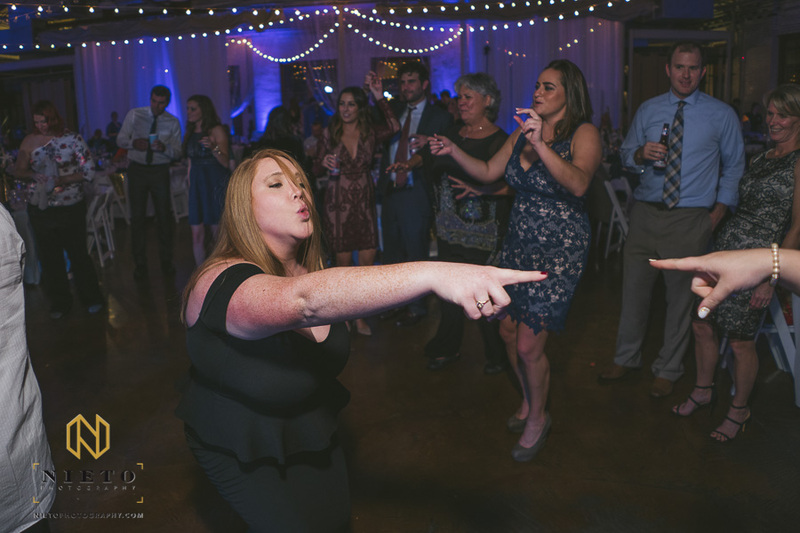 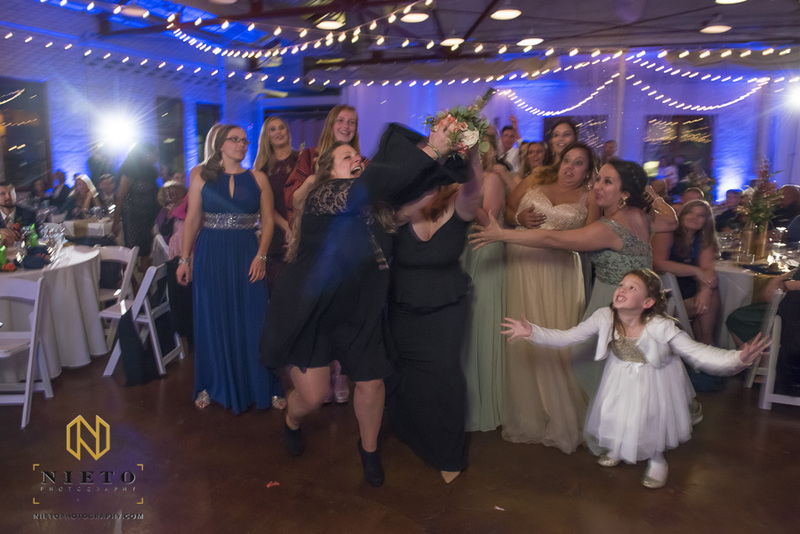 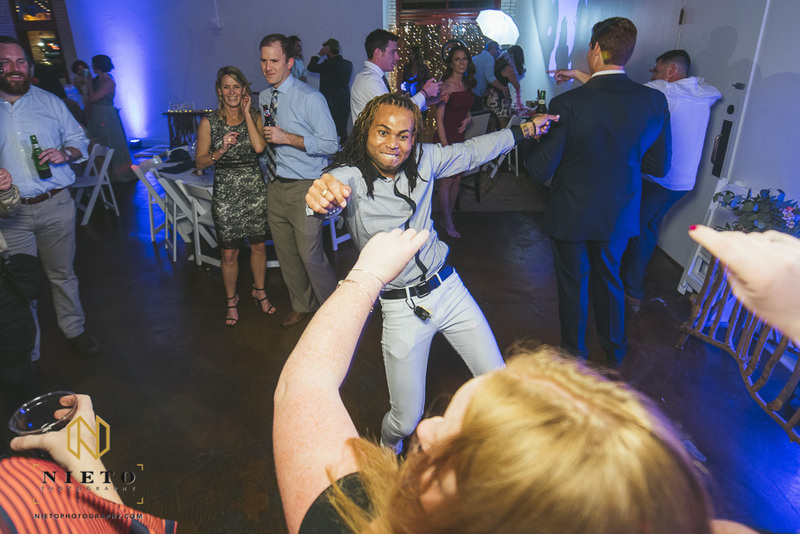 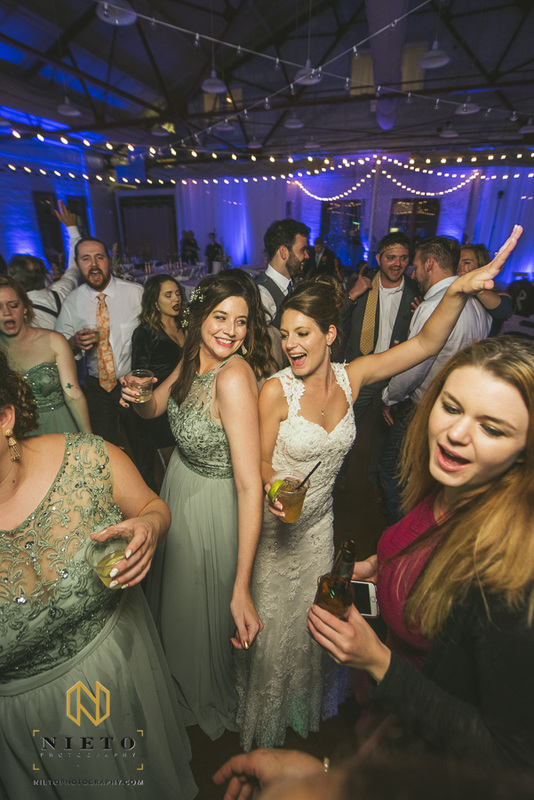 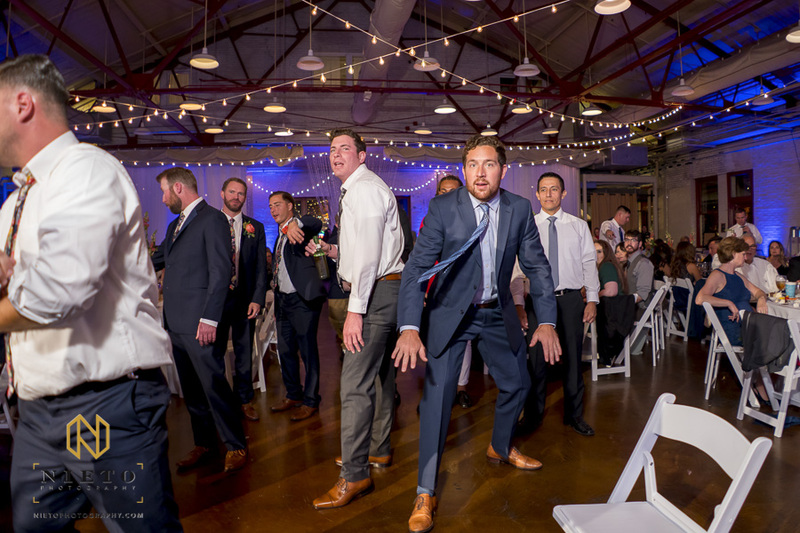 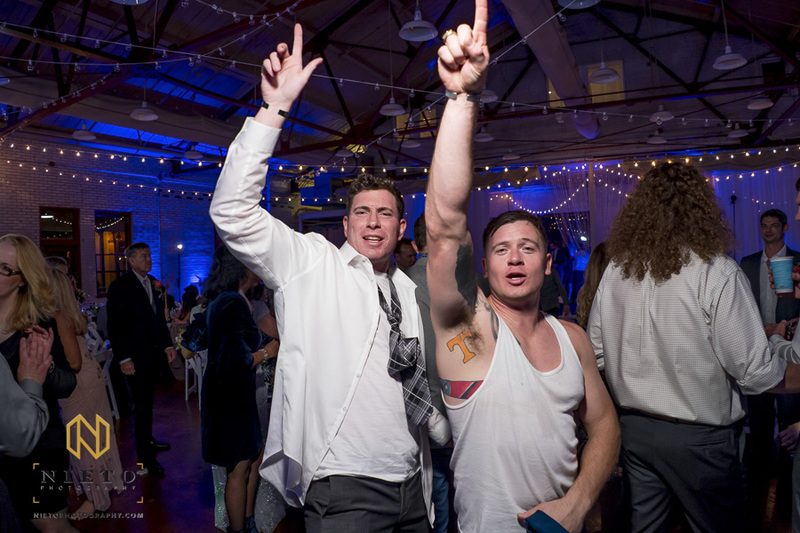 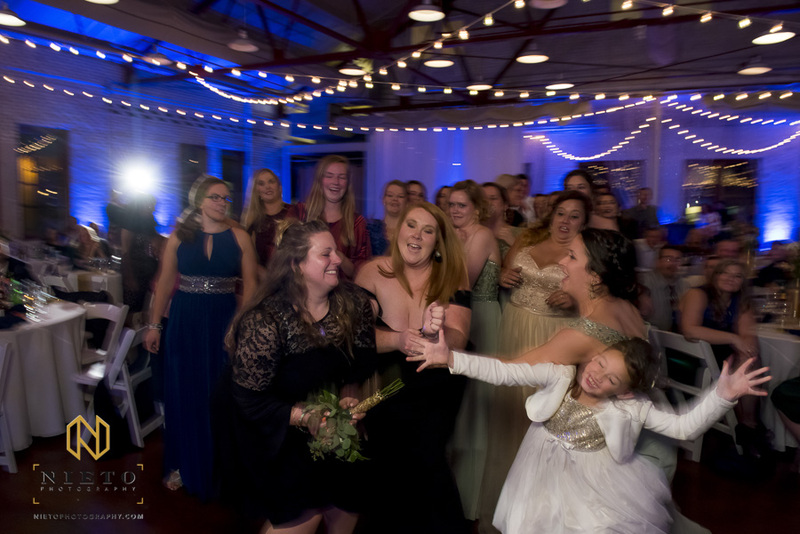 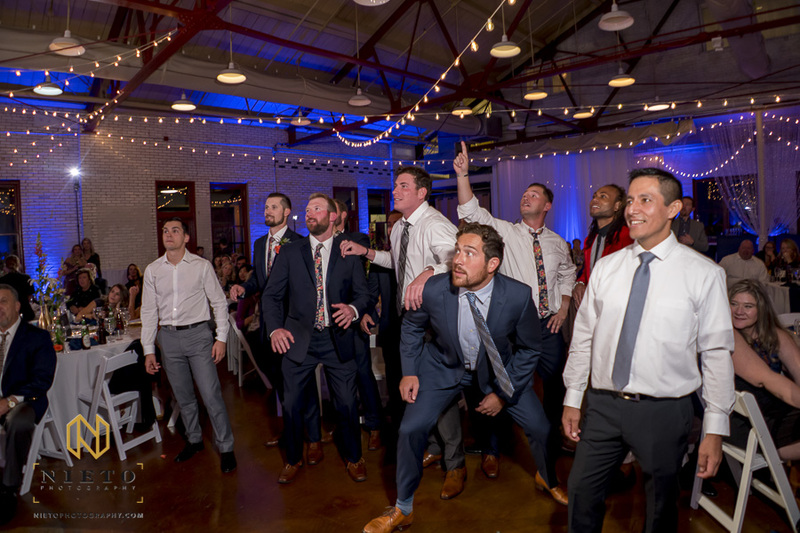 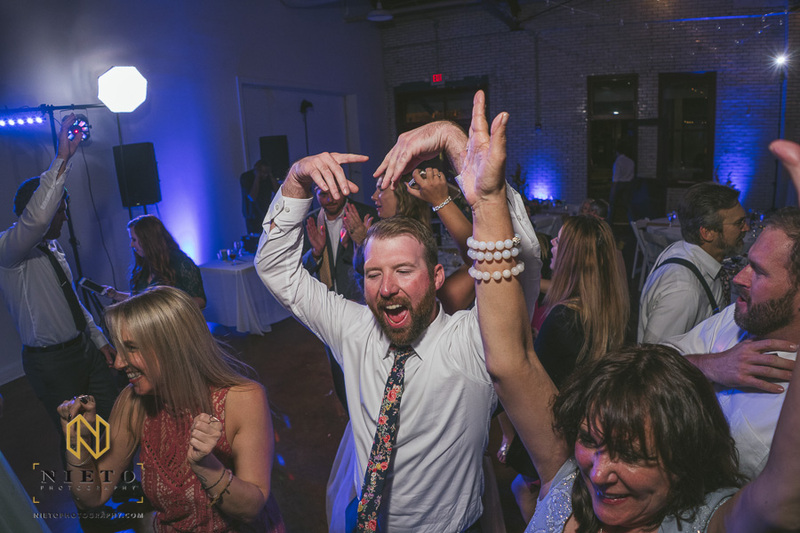 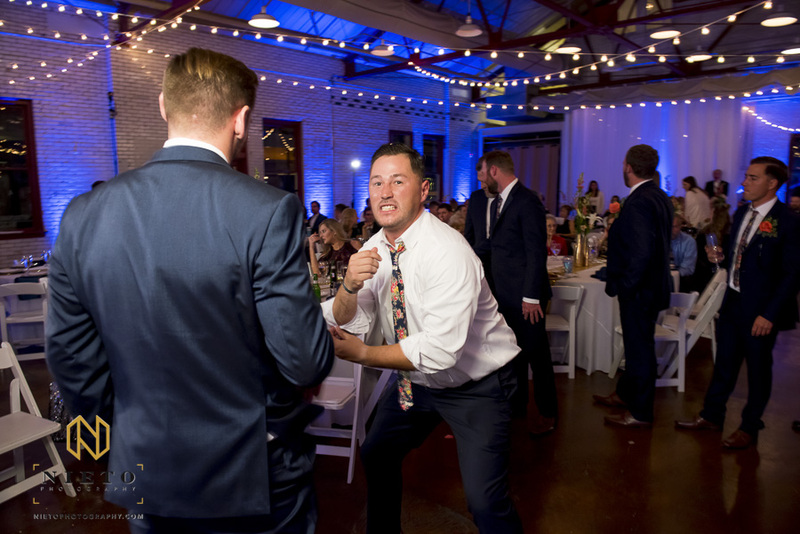 It was easily the most active wedding reception I had in 2017. 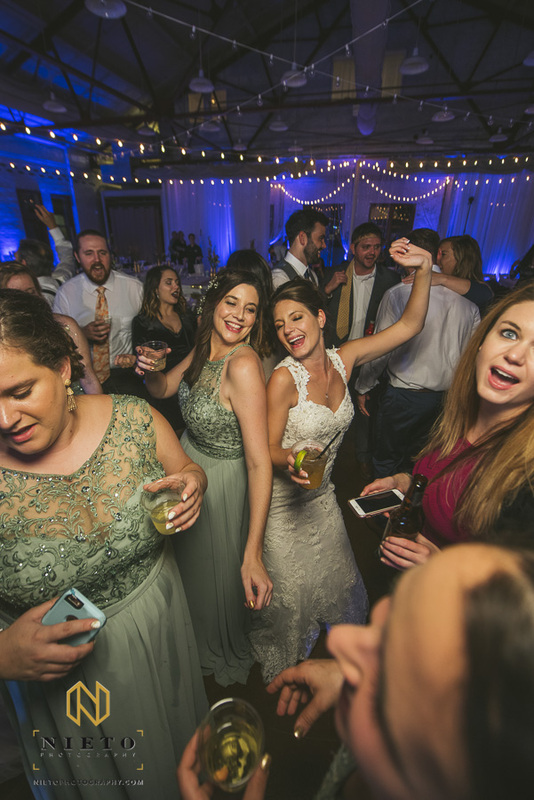 No one stayed in their chairs, the wedding party to the grandparents were all on the dance floor, in the photo-booth, or at the bar. 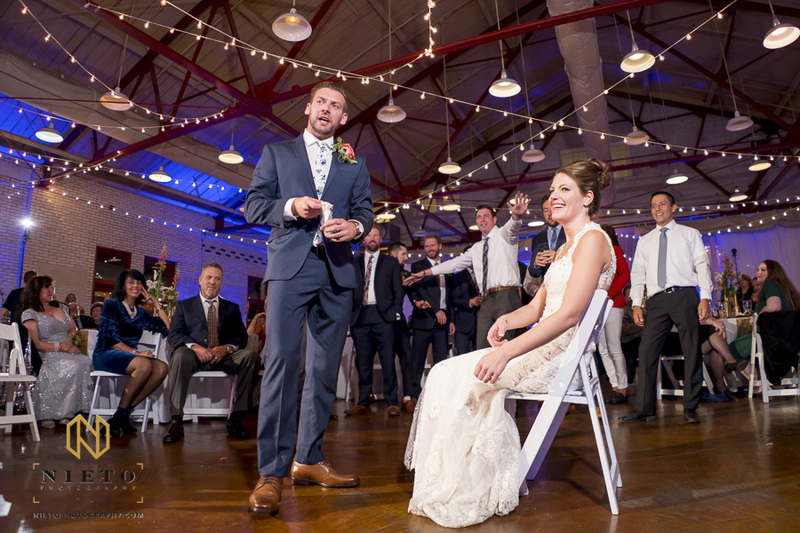 Part 2 of Brad and Carolyn’s wedding. 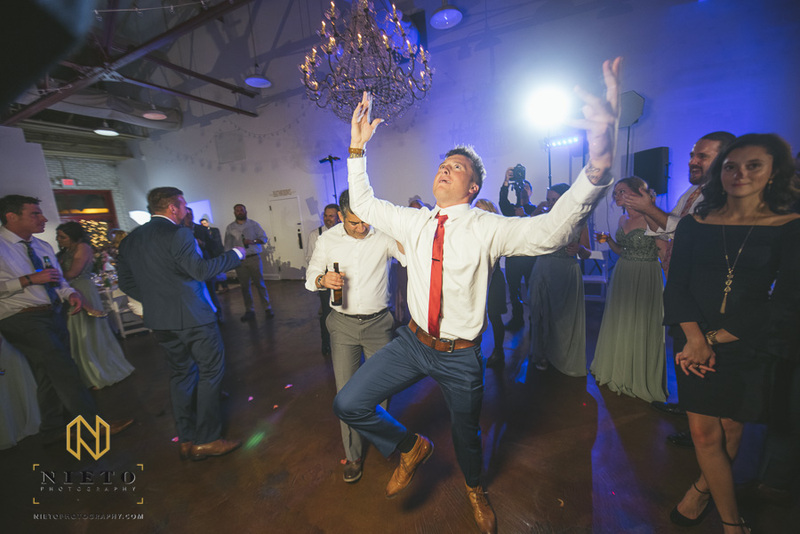 Check out Part 2 here. 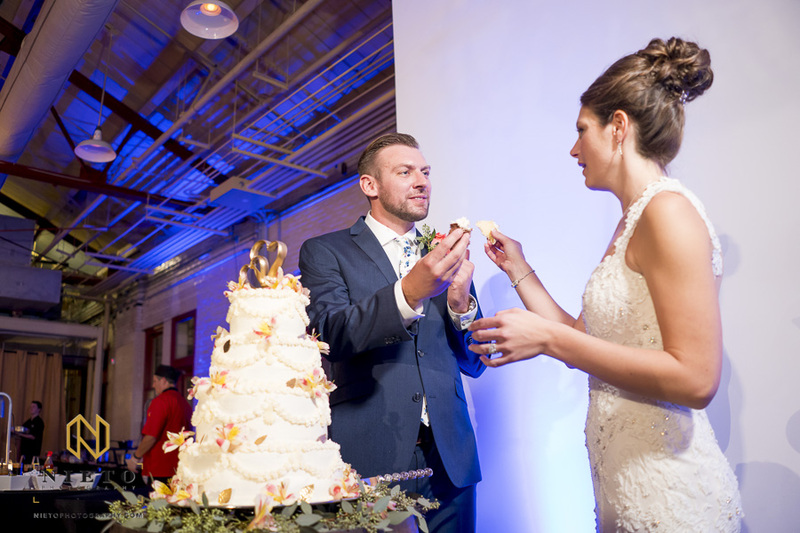 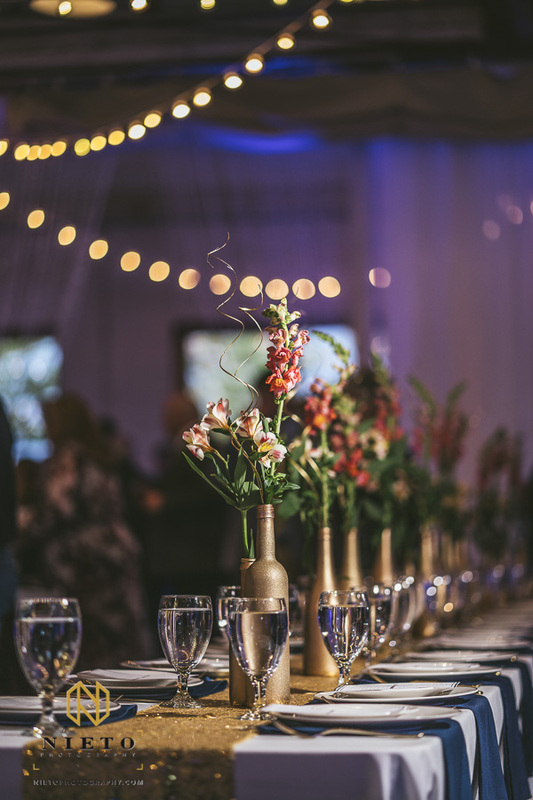 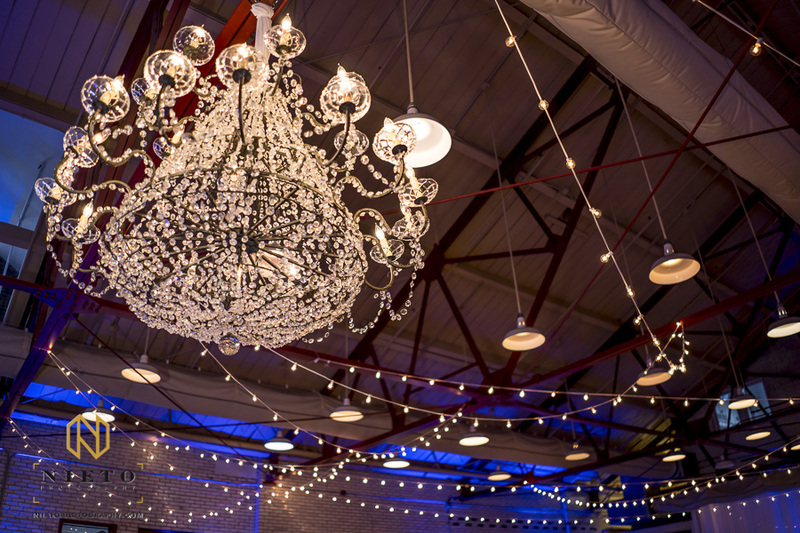 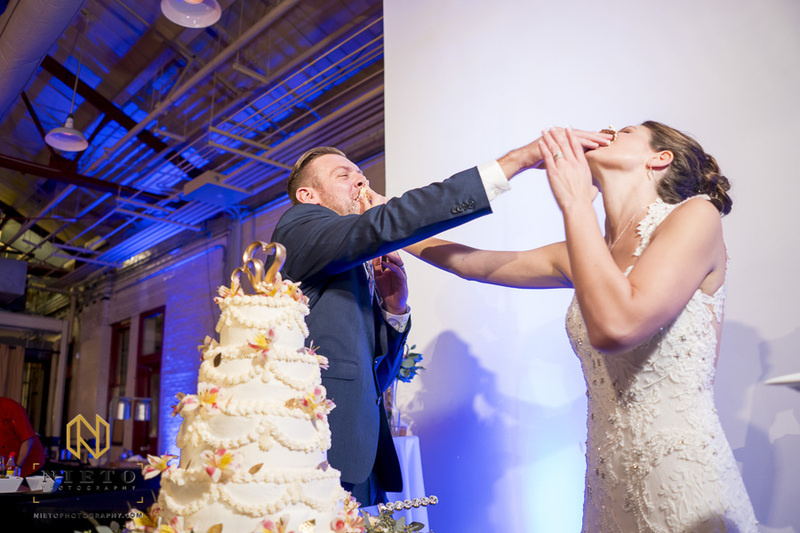 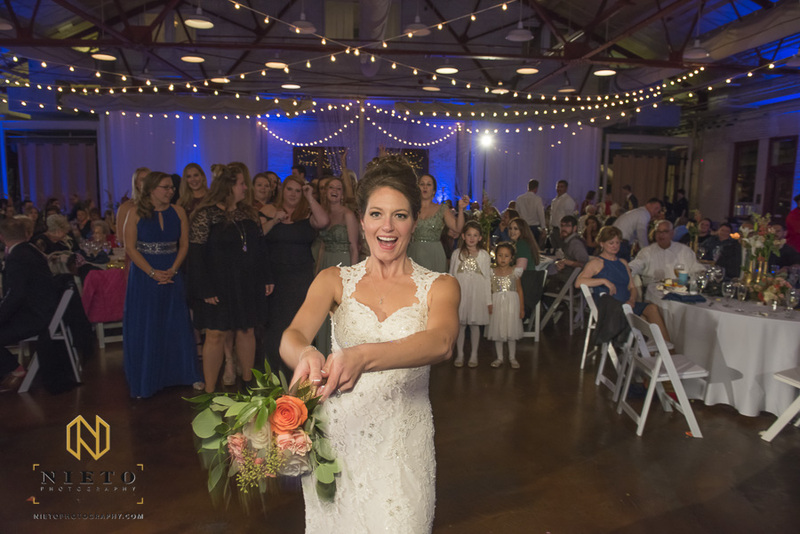 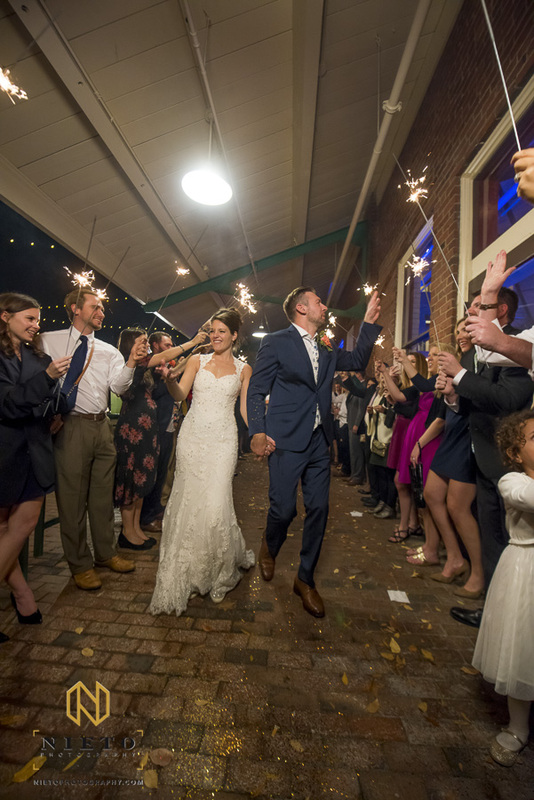 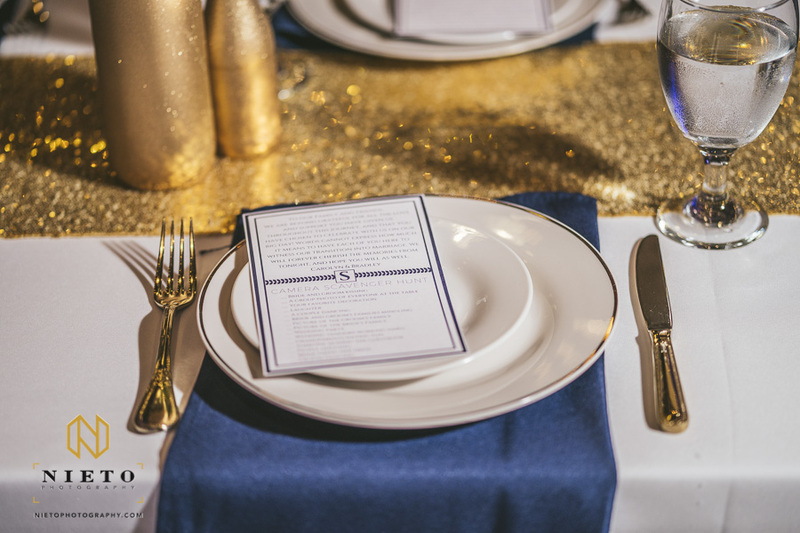 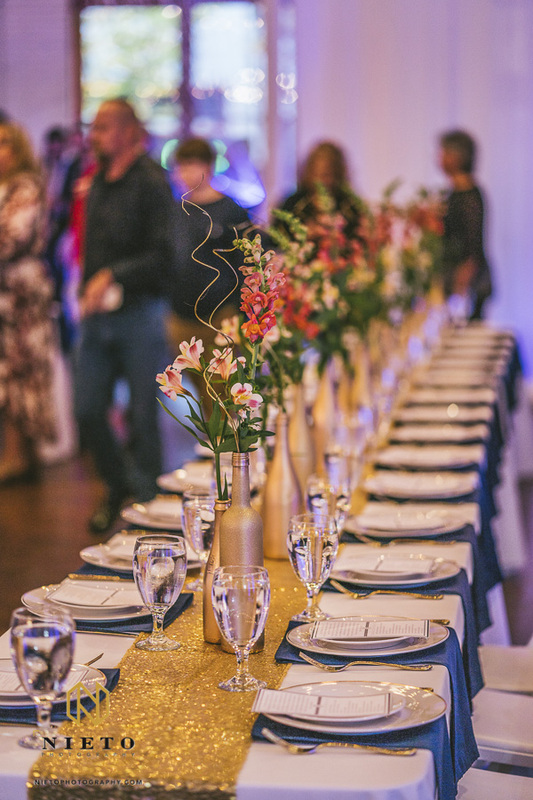 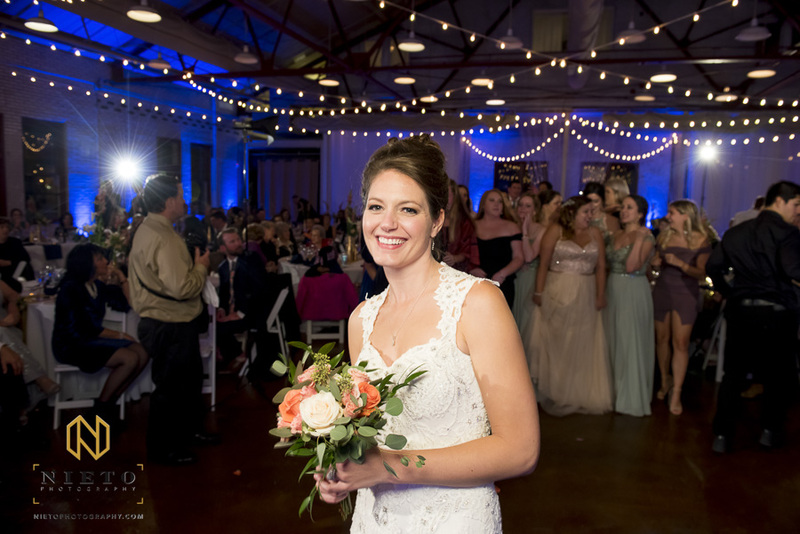 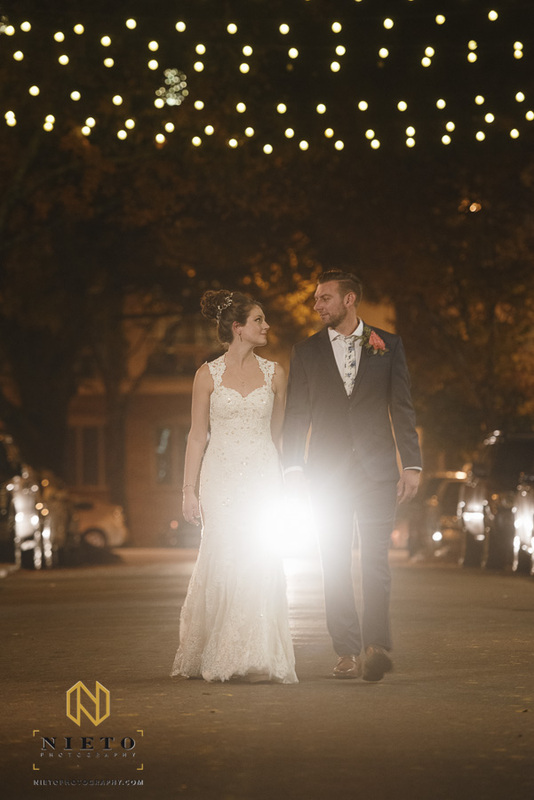 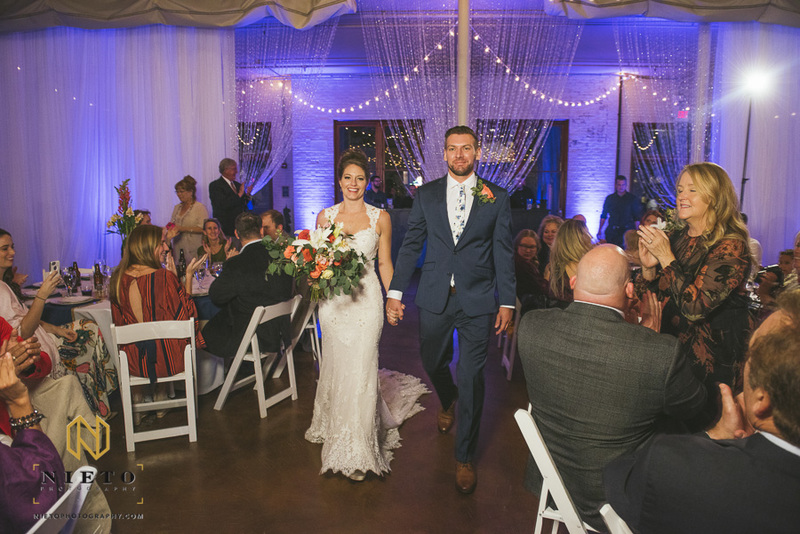 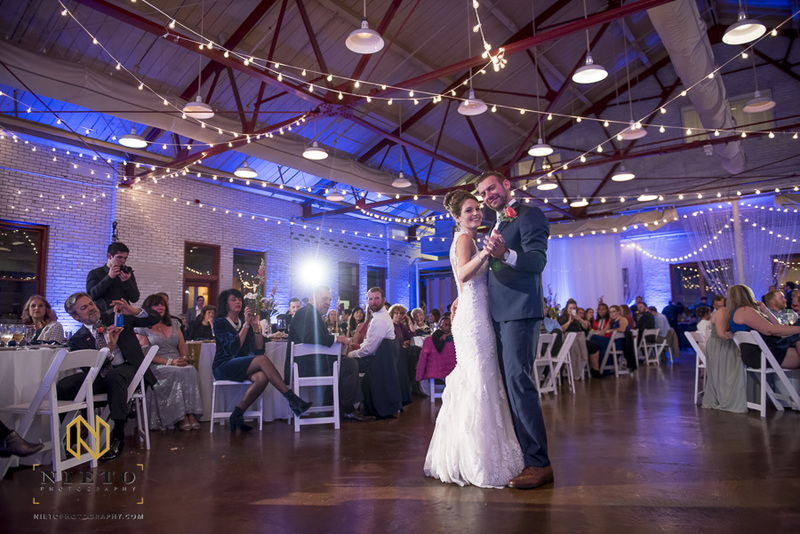 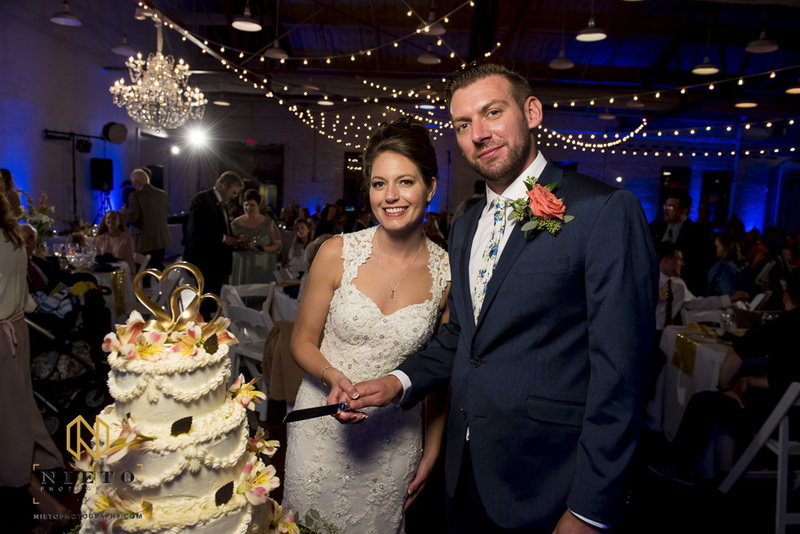 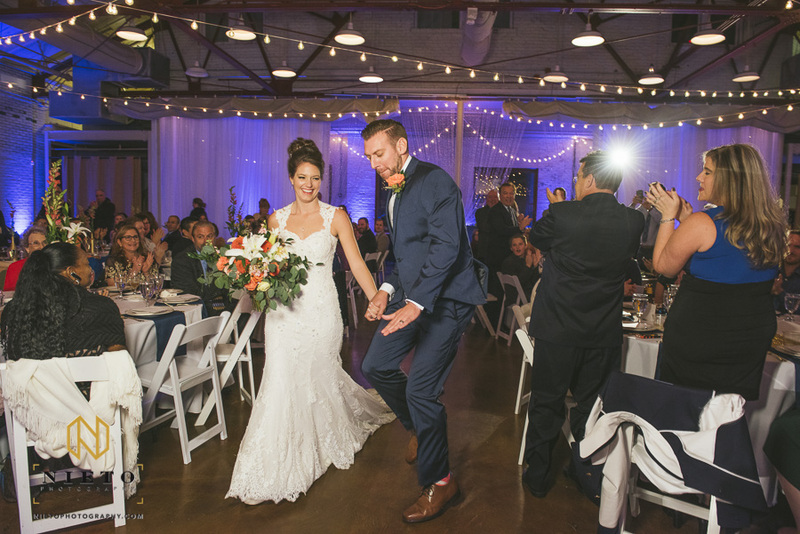 The first details you notice when walking into Brad and Carolyn’s Market Hall wedding were the lighting and the food. 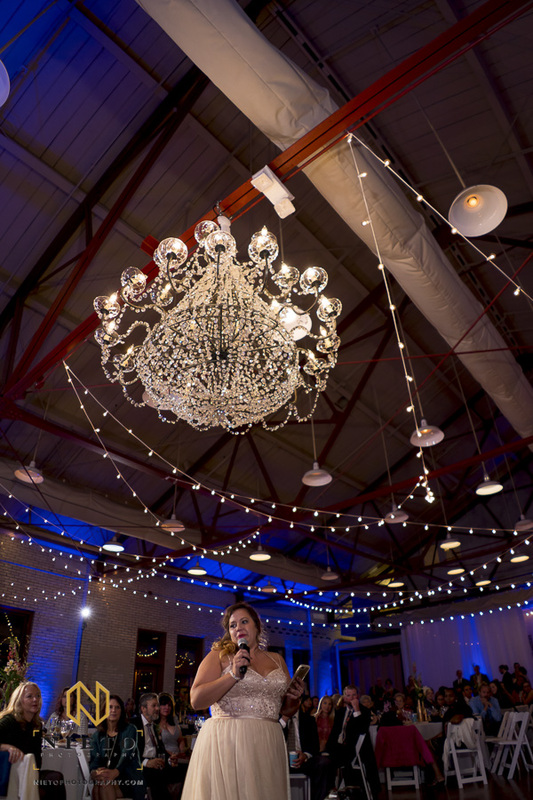 The giant chandelier from Themeworks hanging over the sweetheart table to the purple uplighting bathing the room. 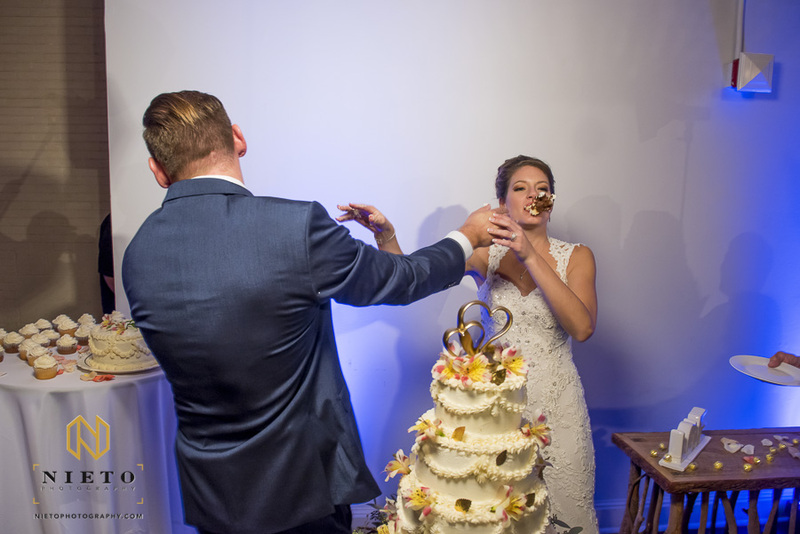 The second detail was the massive buffet. 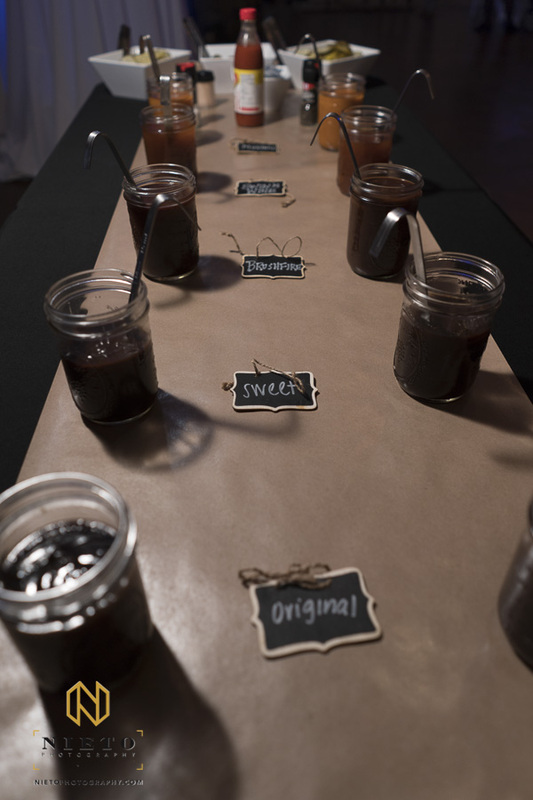 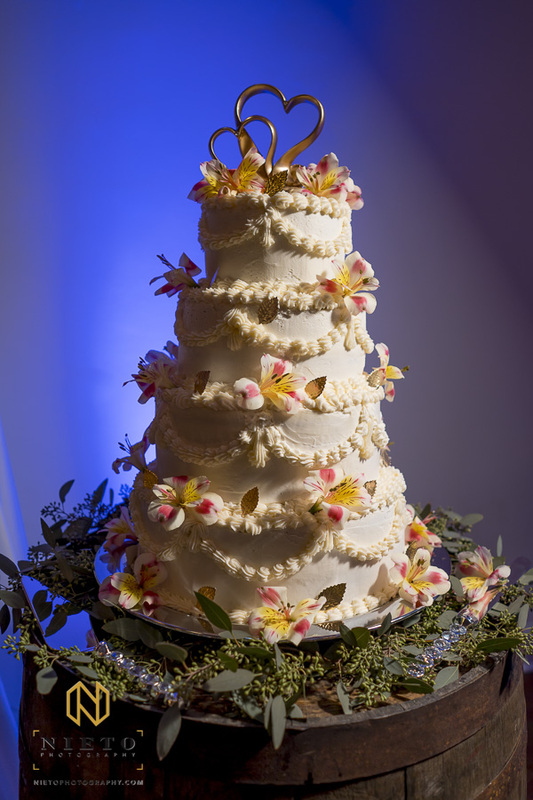 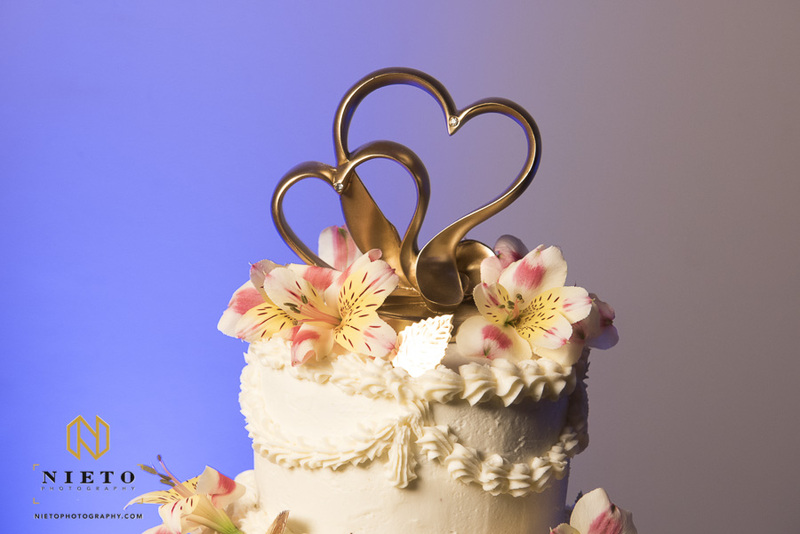 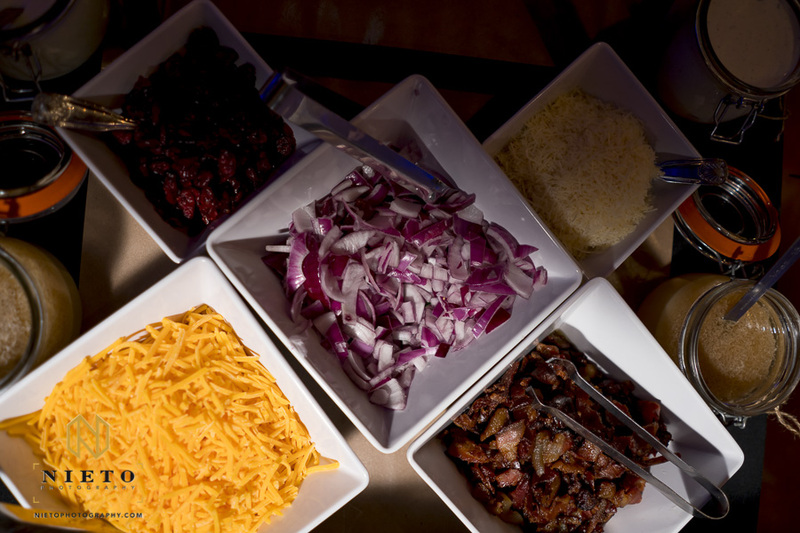 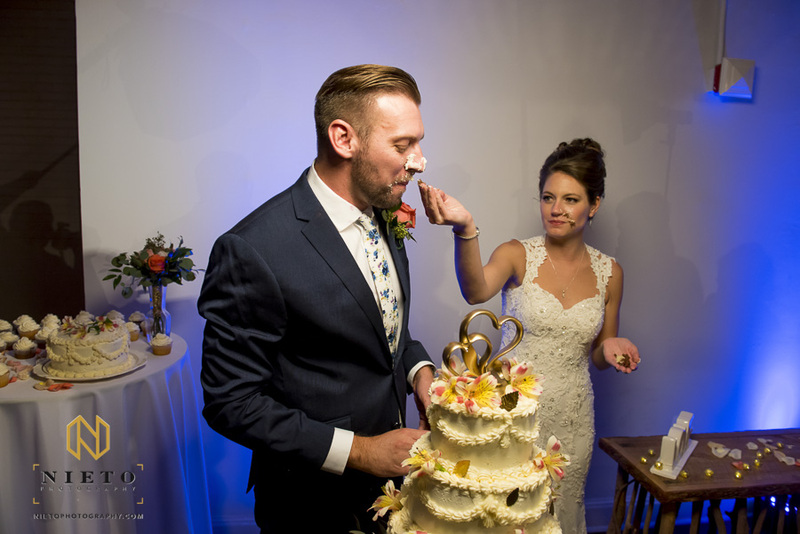 The guest were treated to an delicious buffet from City BBQ and a decadent cake made by Carolyns aunt. 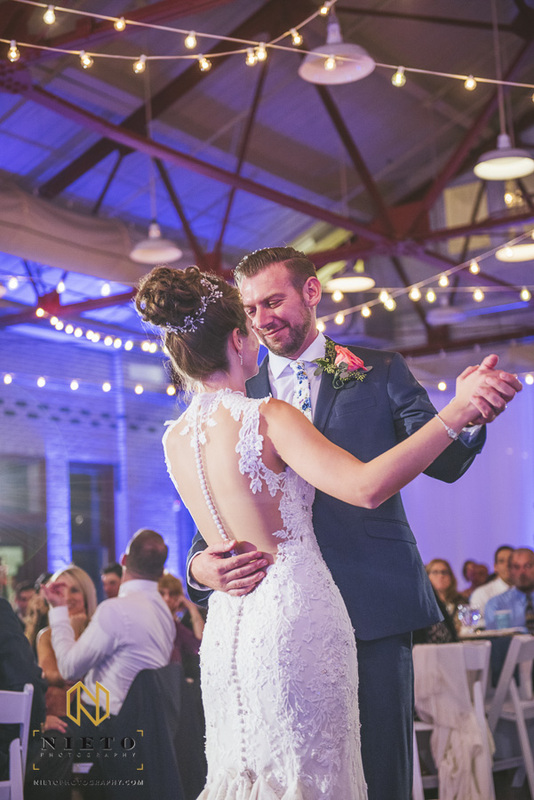 The night started off with the bride and grooms introduction and into their first dance. 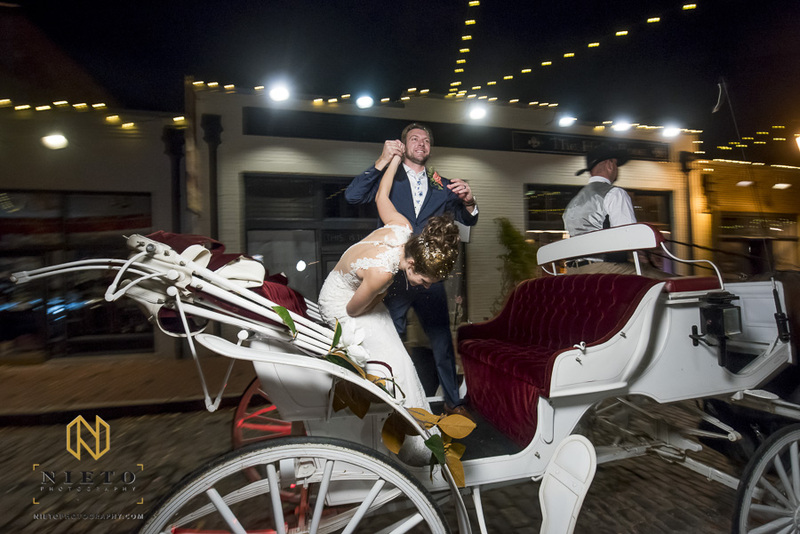 While all the guest are finishing their meals, I try to get the bride and groom to sneak away from a few minutes and do night portraits. 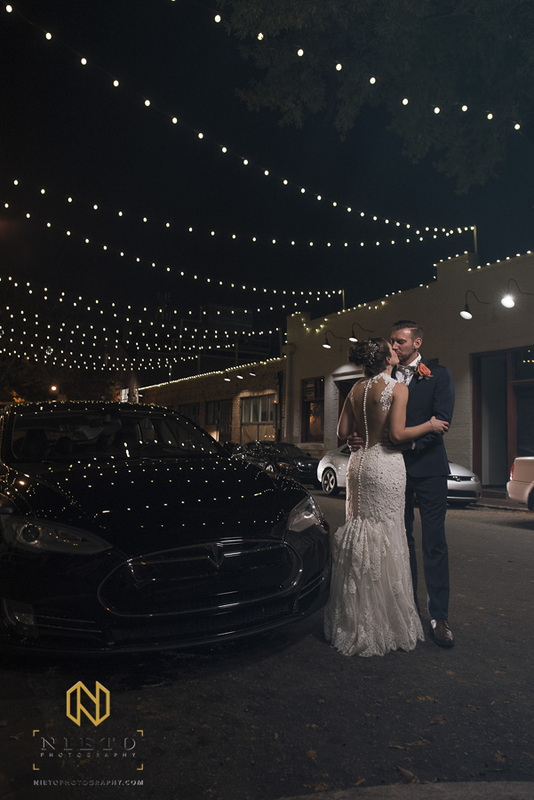 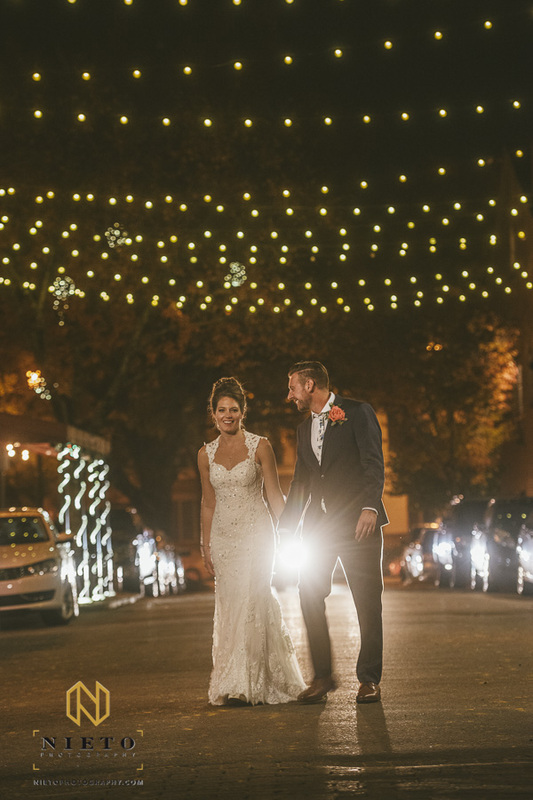 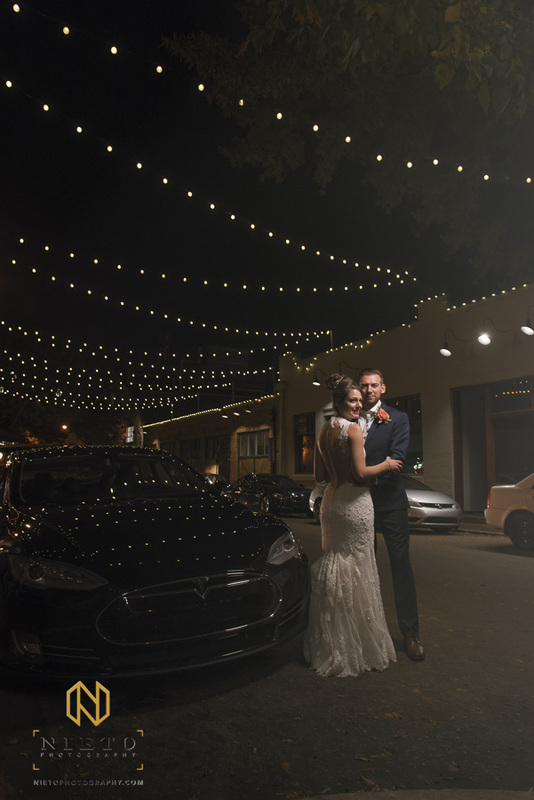 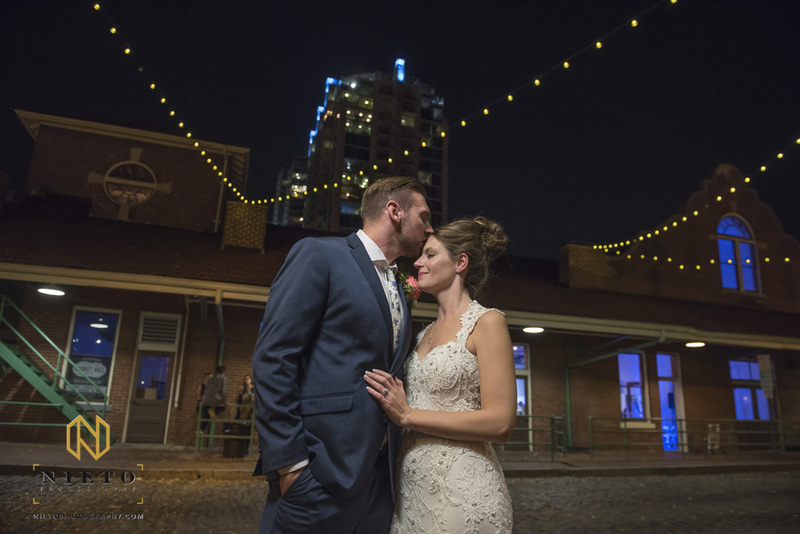 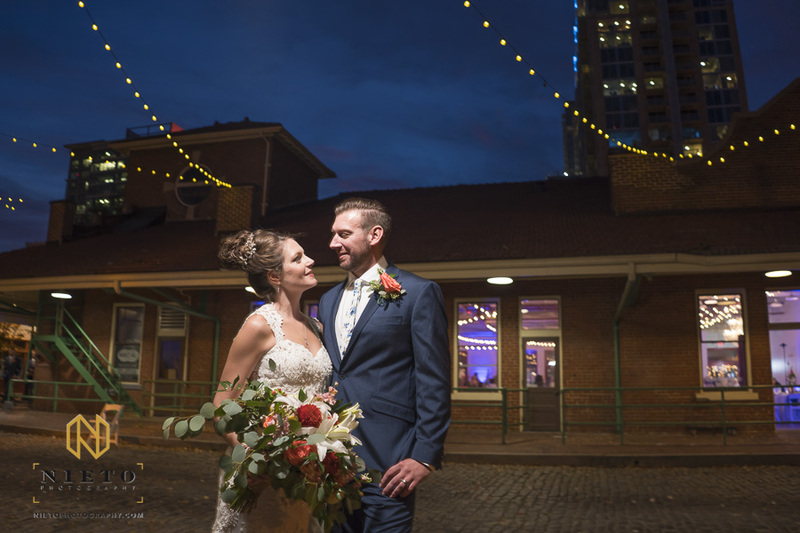 Brad and Carolyn had an especially scenic location, with Market Hall having great outdoor lighting. 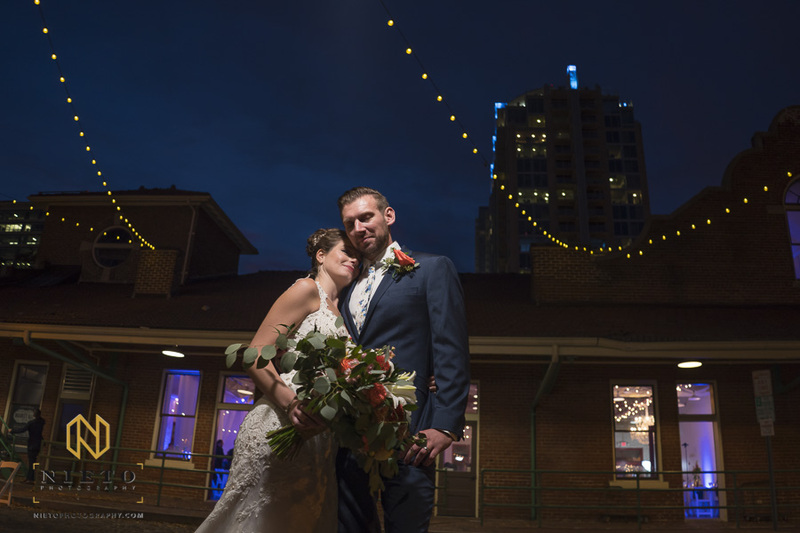 The night portrait session is one of my favorite times during the wedding day. 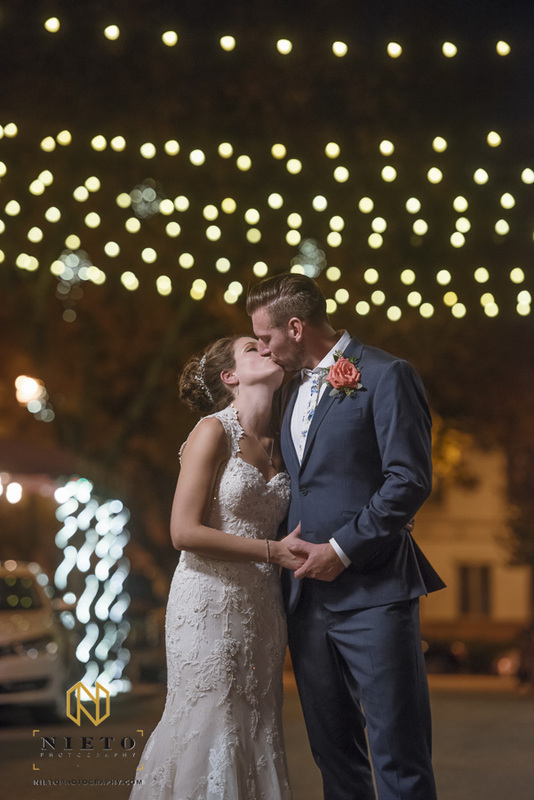 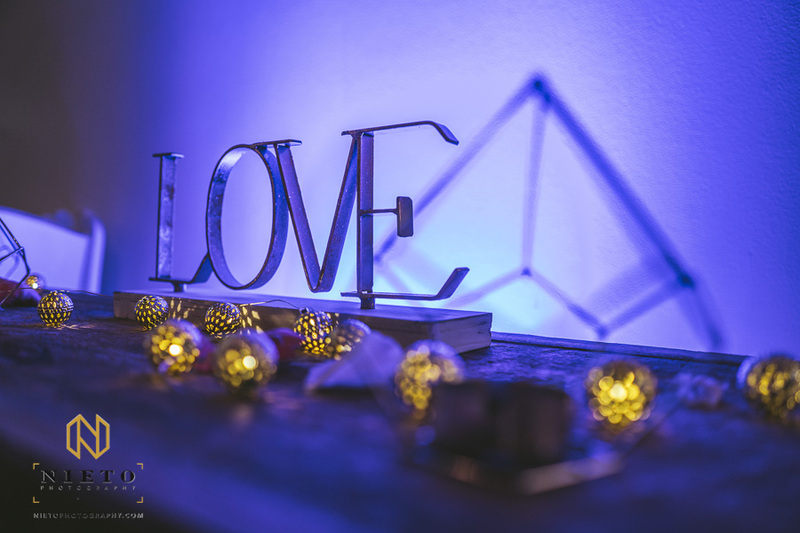 It allows for some special and dynamic portraits, that can show off the bride and grooms love and the beauty of the wedding venue. 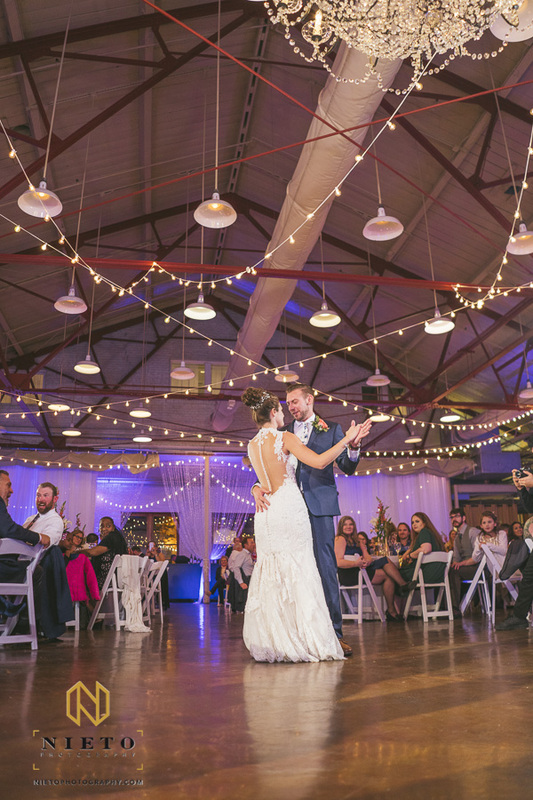 More Dancing at Market Hall!!! 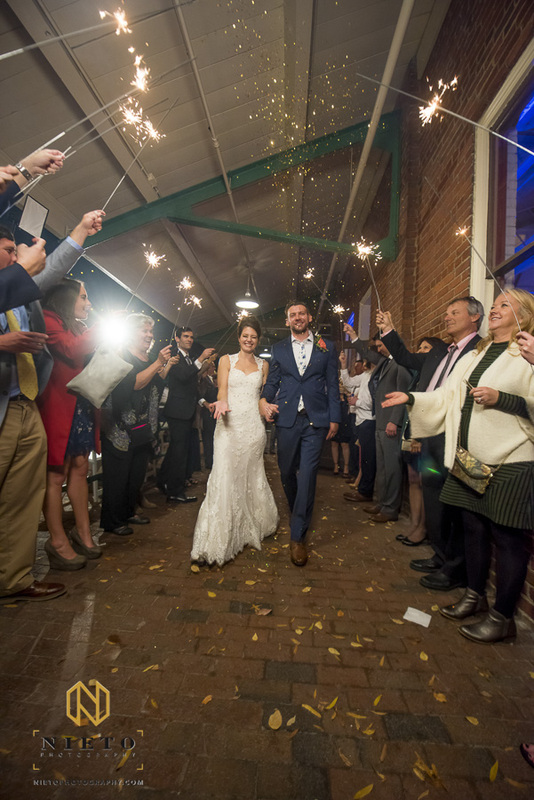 The final event of the evening was the bride and groom send off. 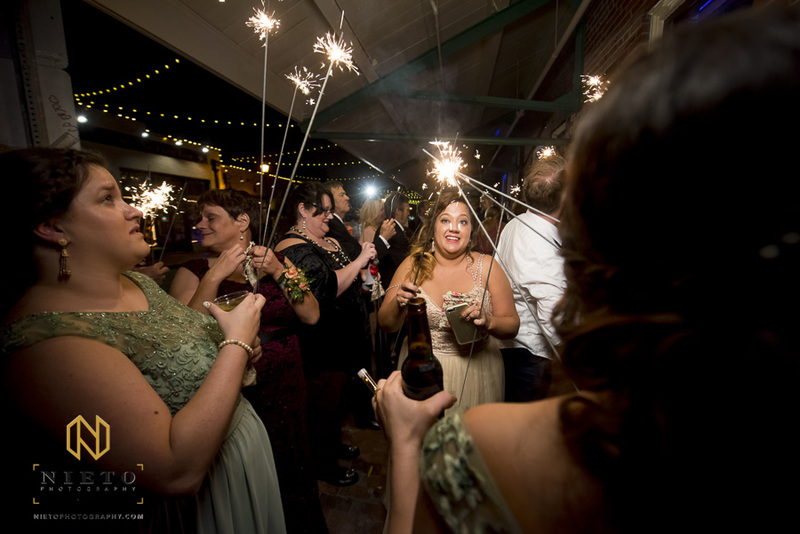 Carolyn had a vision for her wedding exit, glitter and sparklers. 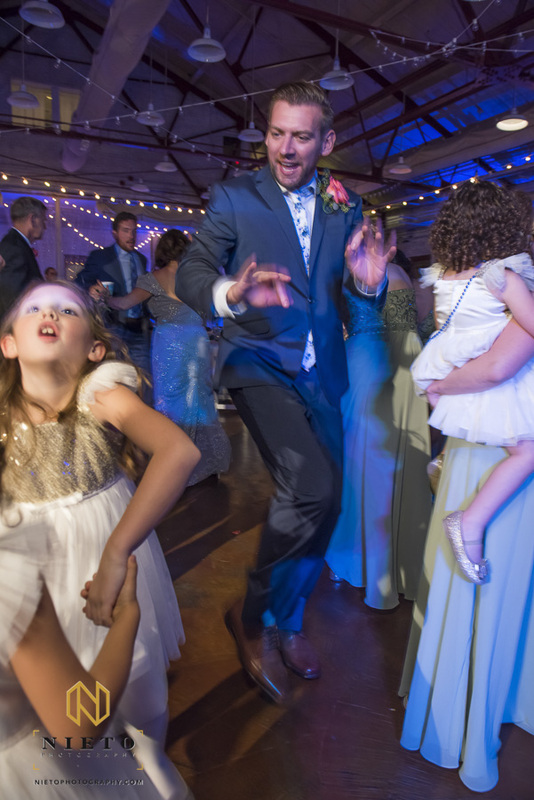 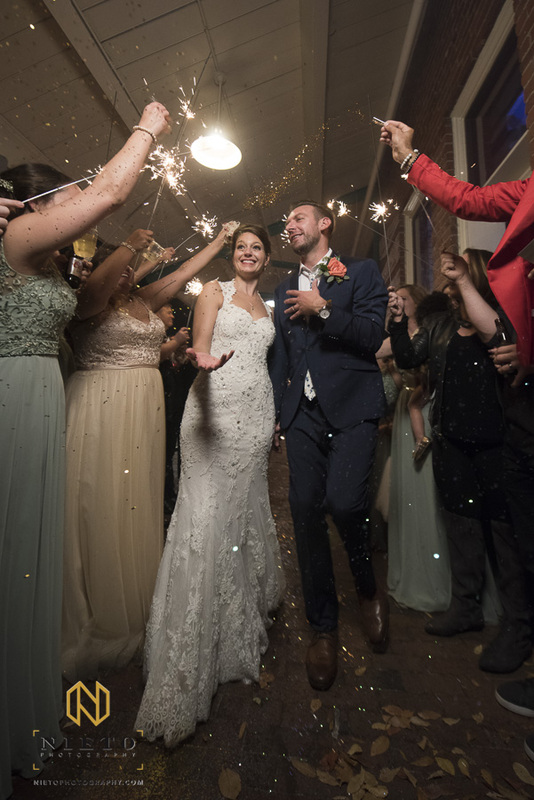 This was my first glitter exit and Brad and Carolyn’s wedding guest did not disappoint. 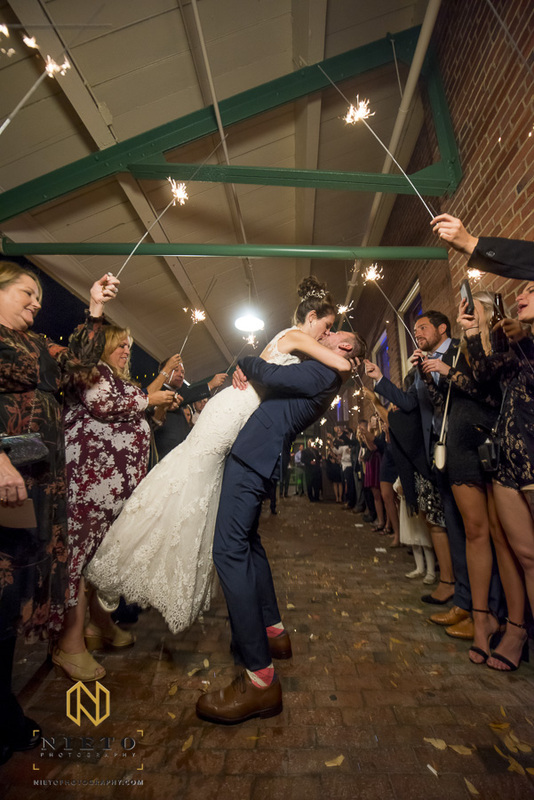 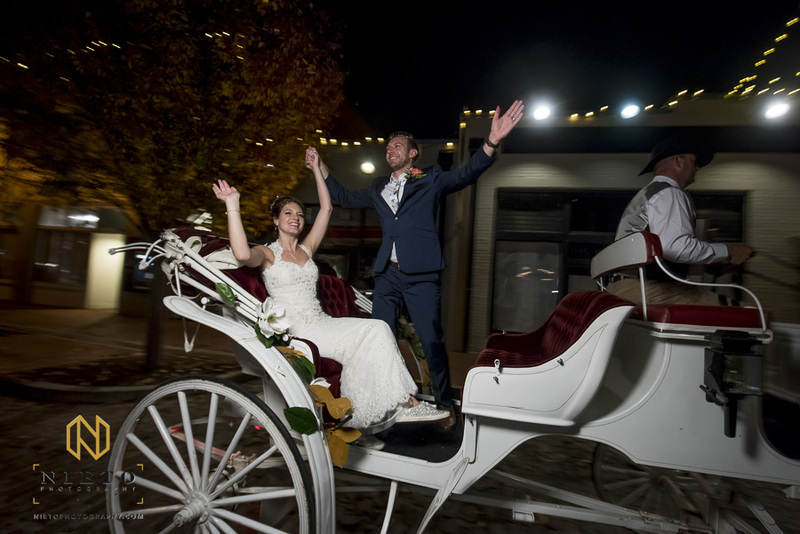 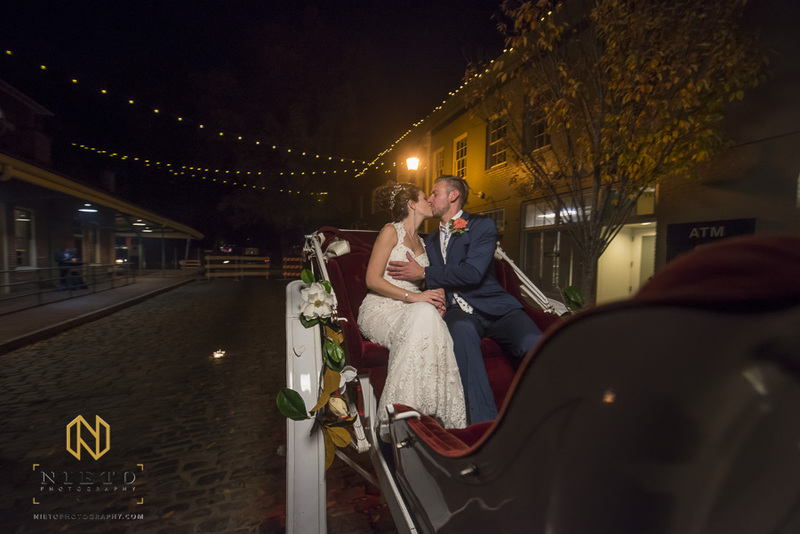 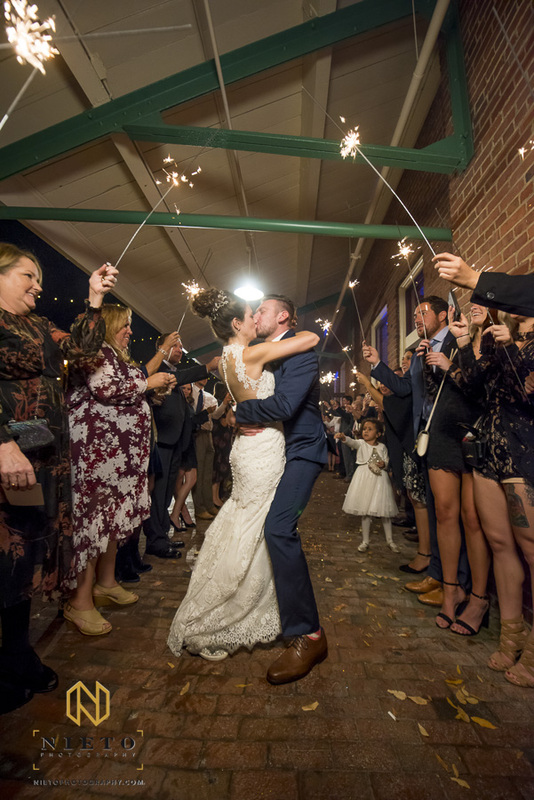 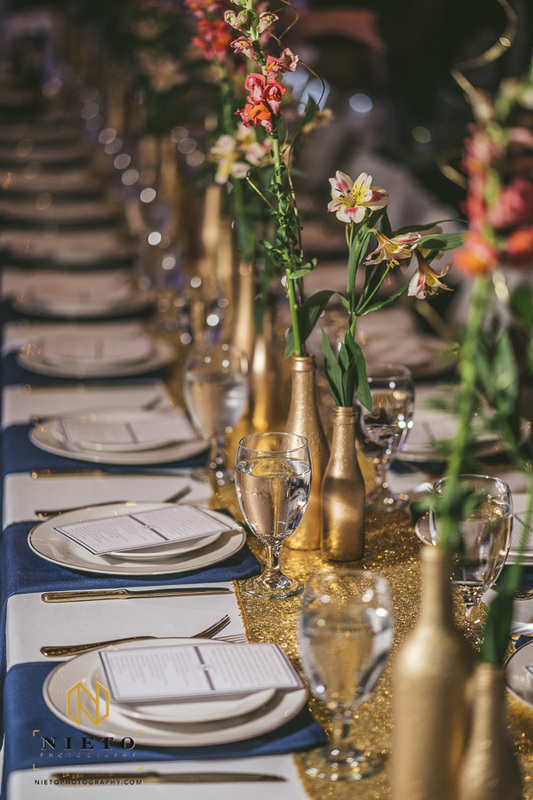 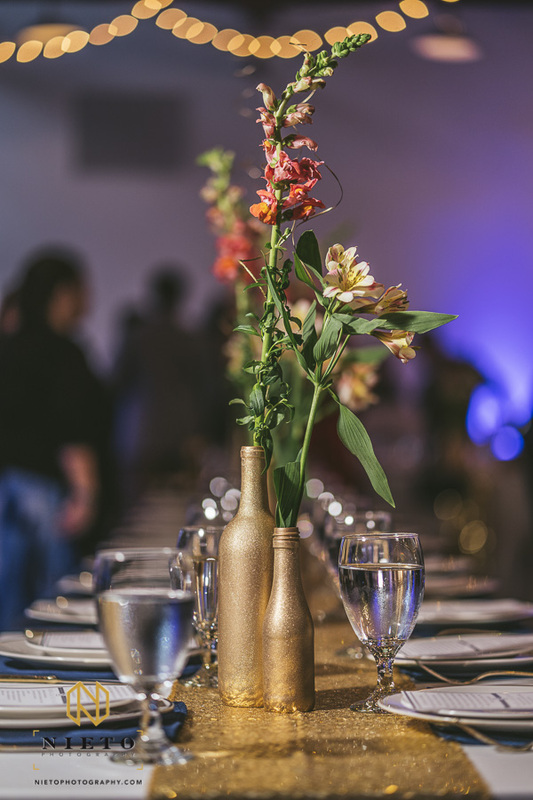 Once the they passed the gauntlet of wedding guest with glitter and fire sticks, they hopped into their horse drawn carriage and disappeared into the night. 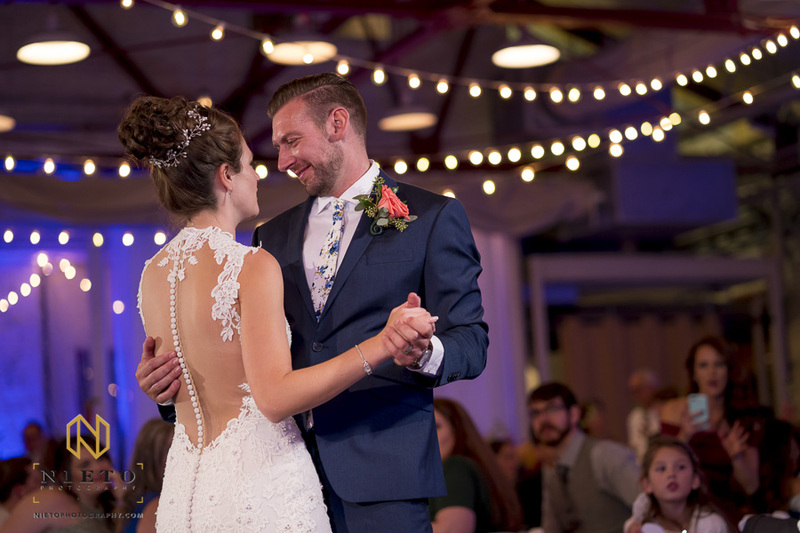 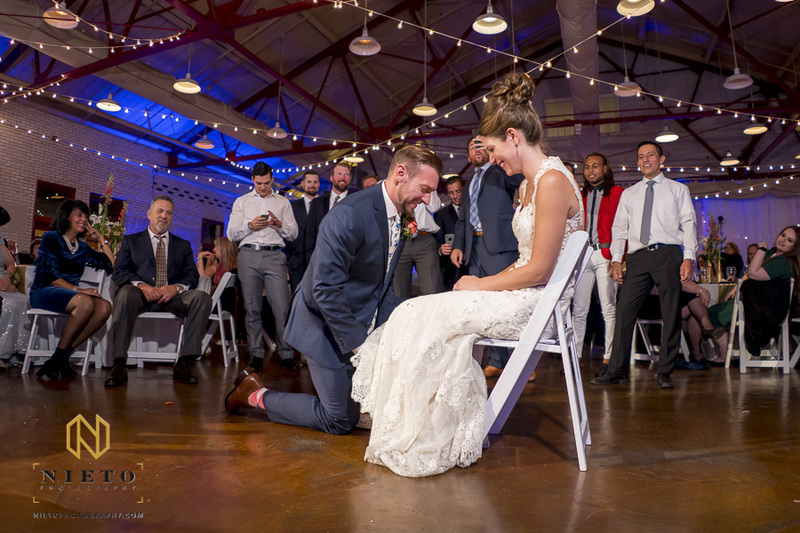 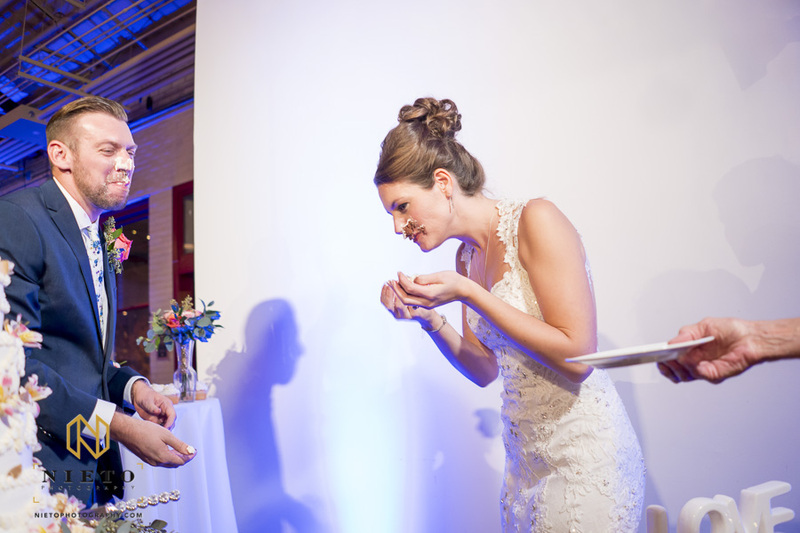 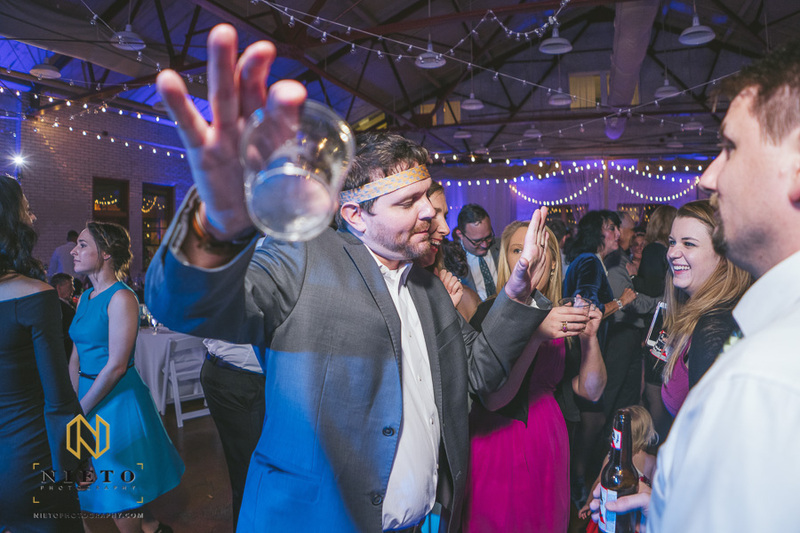 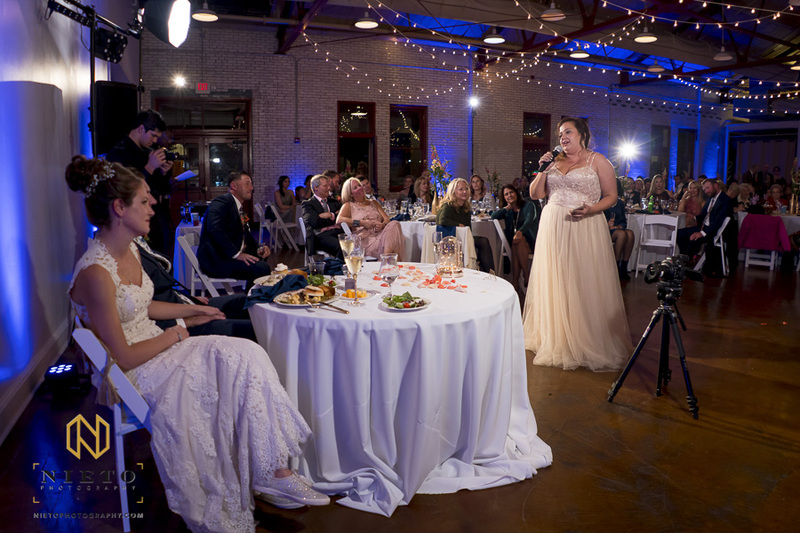 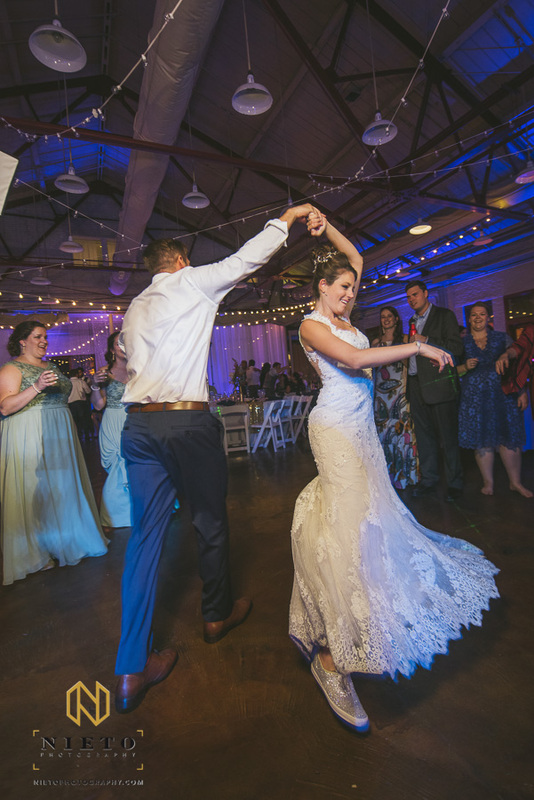 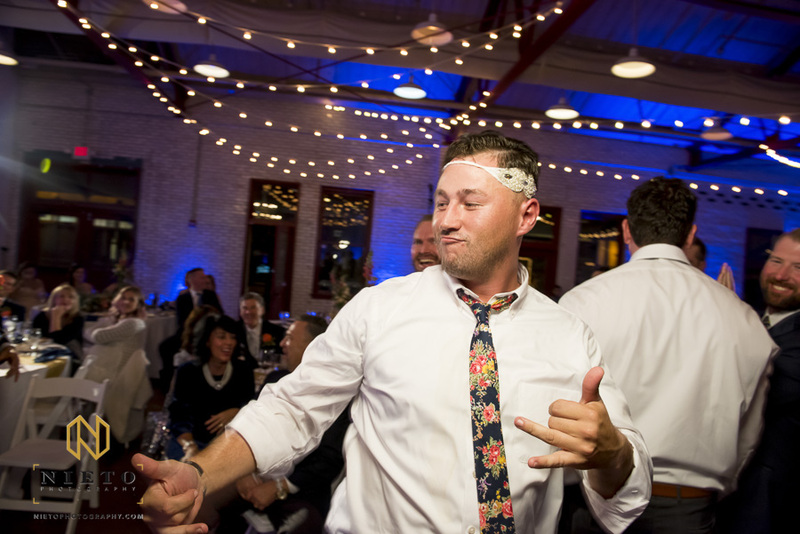 If you liked these Market Hall wedding images, please feel free to fill out my contact form. 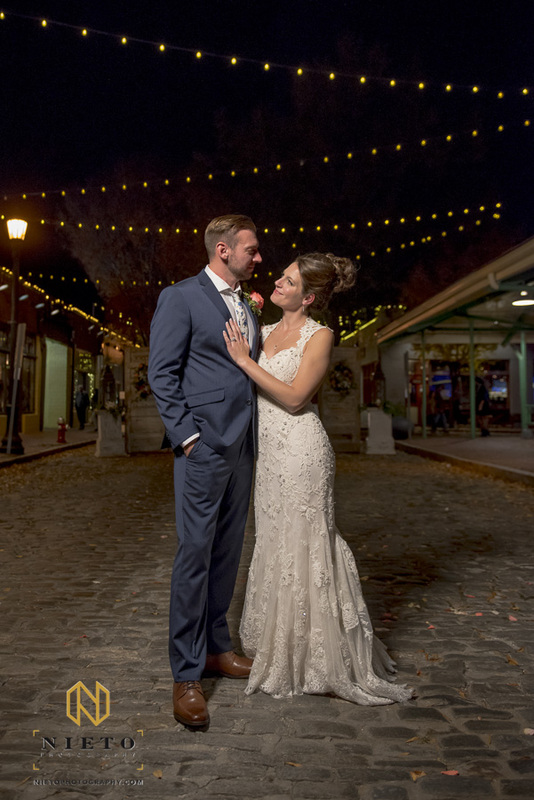 I would love to talk to you about your wedding plans.